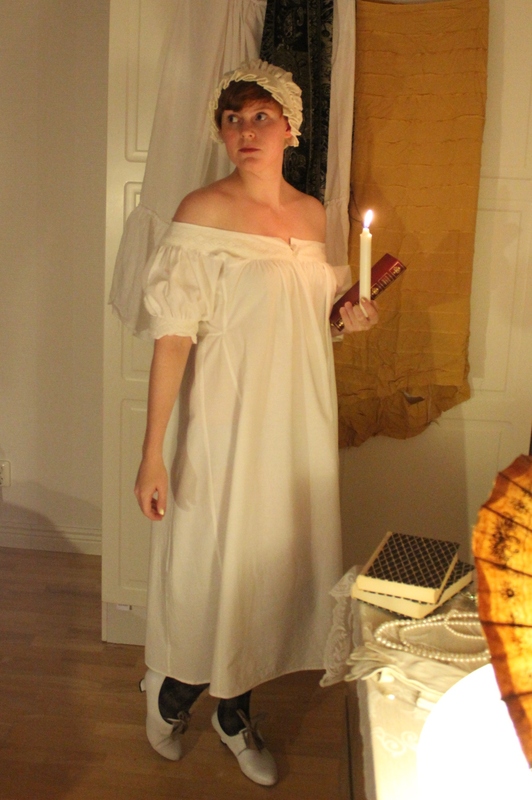 Here comes another batch from last years Halloween photoshoot. 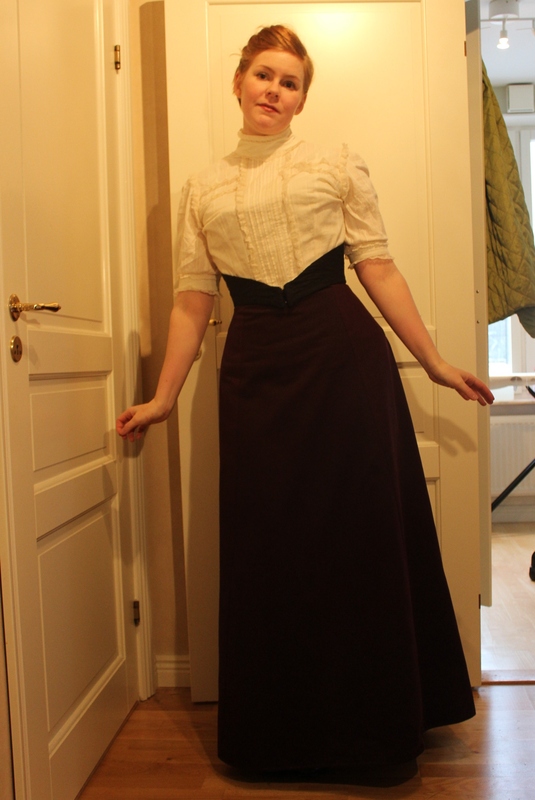 This time we are doing the classical vampire in my Edwardian lingere getup. 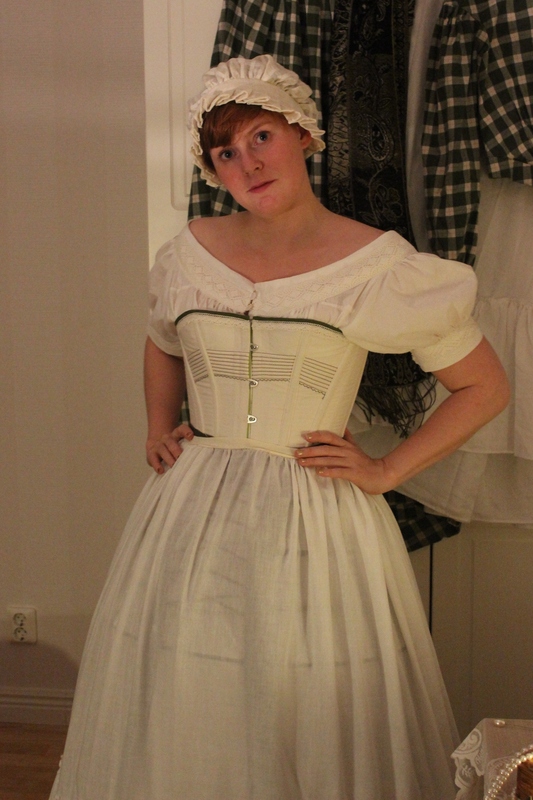 The first thing I needed for my Borgia dress was a new chemise. 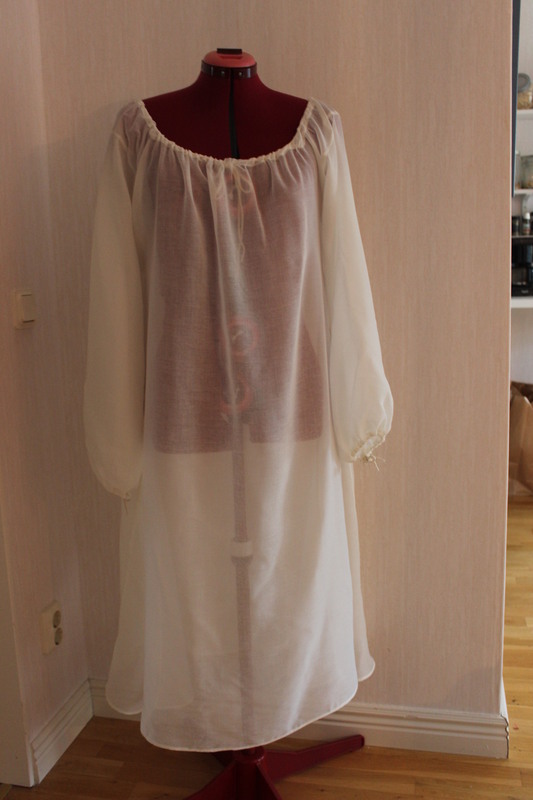 I wanted one with lots of floowy fabrics and huge sleeves to pouf through the holes in the outer dress. Not as fancy as this one, but in the same style. 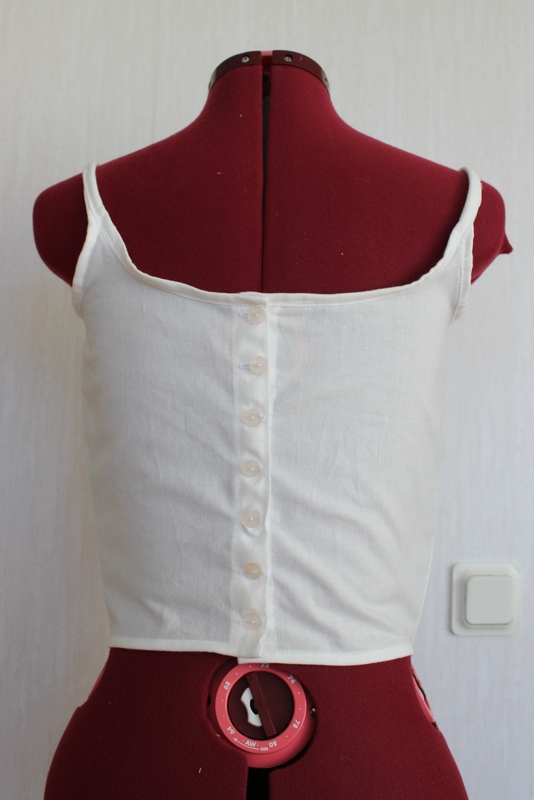 And since a chemise is basically made out of squares, I didn’t use any pattern but used sketches like this one and the one in “The Tudor Tailor” for reference. 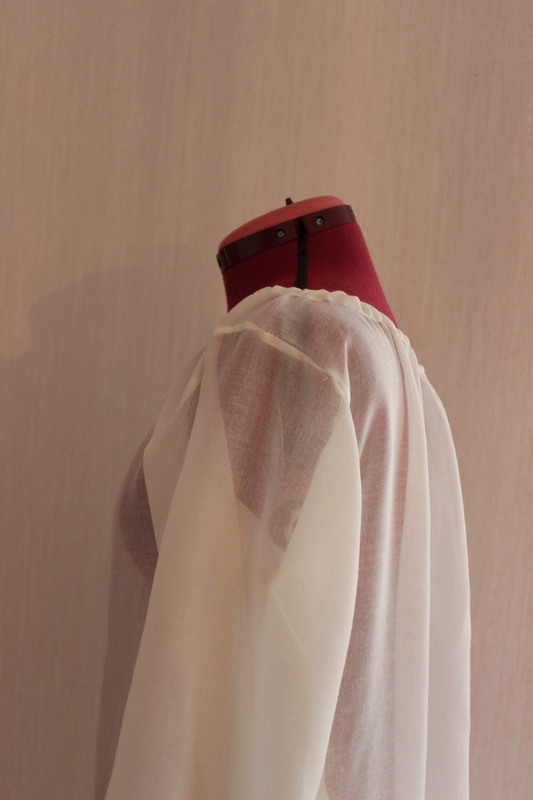 I used a thin cotton voile, and sewed the whole thing on machine using the french seam as a seam finish. 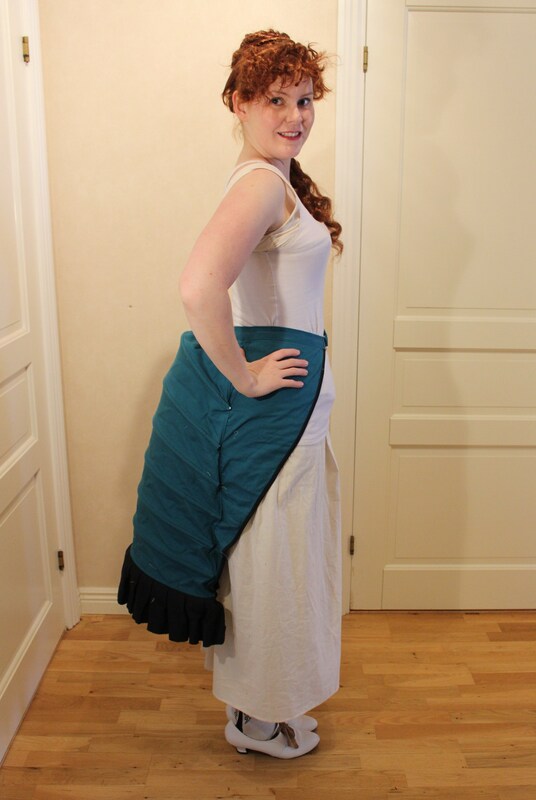 The whole thing went together pretty fast, and I would have made it in one night if I hadn’t messed up and inserted one of the sleeves inside out. 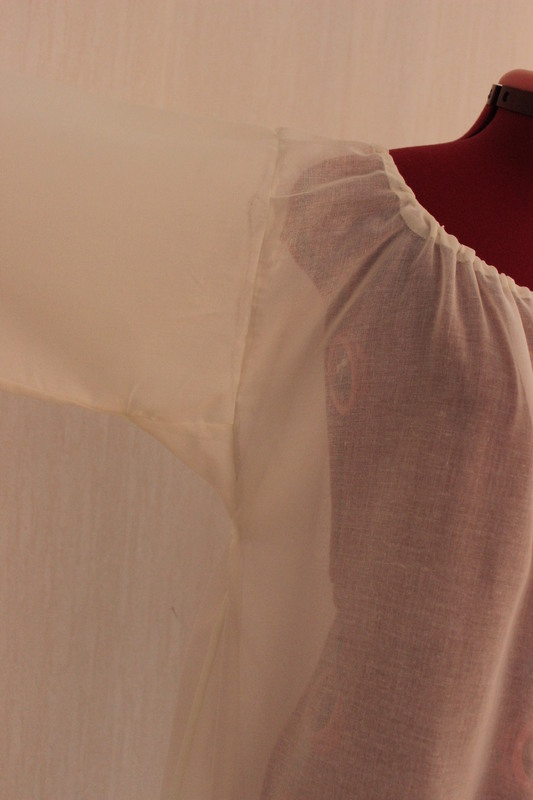 And not only had I set it inside out, I only noticed it after I french seamed the heck out of it. 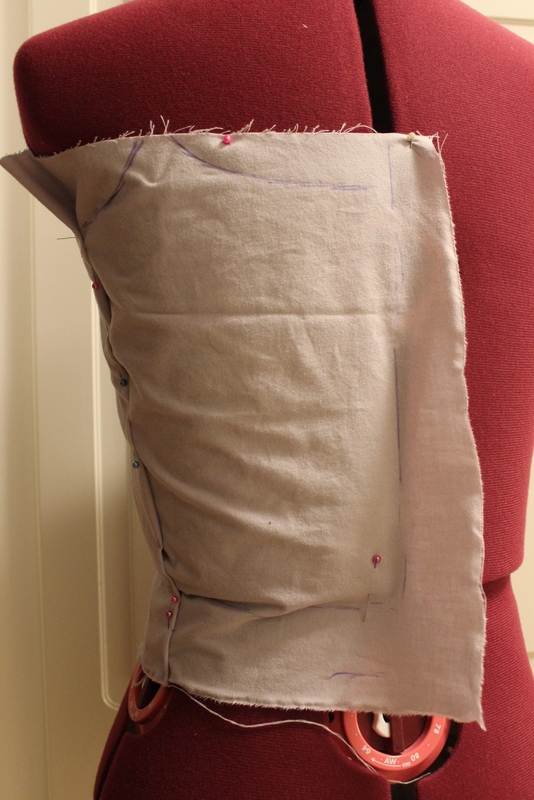 I briefly considering leaving it that way (it’s underwear after all, No one is going to see it), but then I decided to fix it right away to be able to finish that same night. 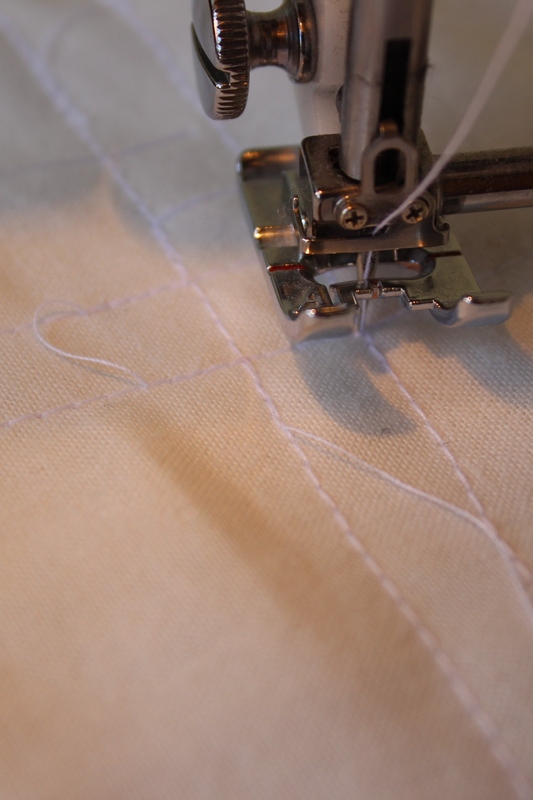 After some hesitation and trying to unpick the tiny stitching, I decided to just cut the whole thing of and start over again. 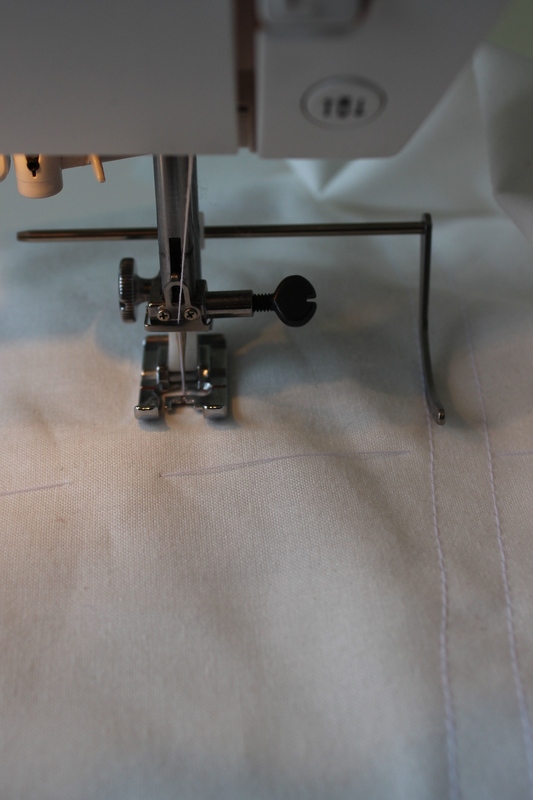 Cutting the seam allowance, to re-set the sleeve. Said and done. 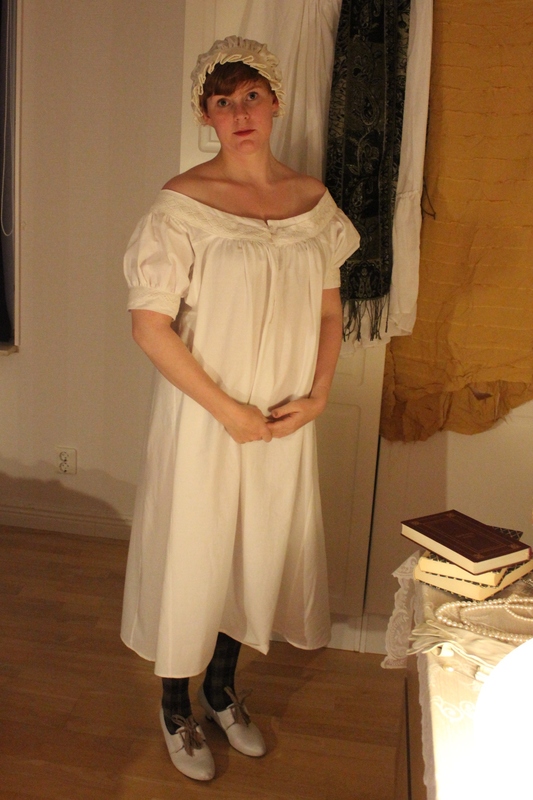 I re-set the sleeve, finished the neckline (with a cord for gathering) and started to steam the finished chemise for photos. 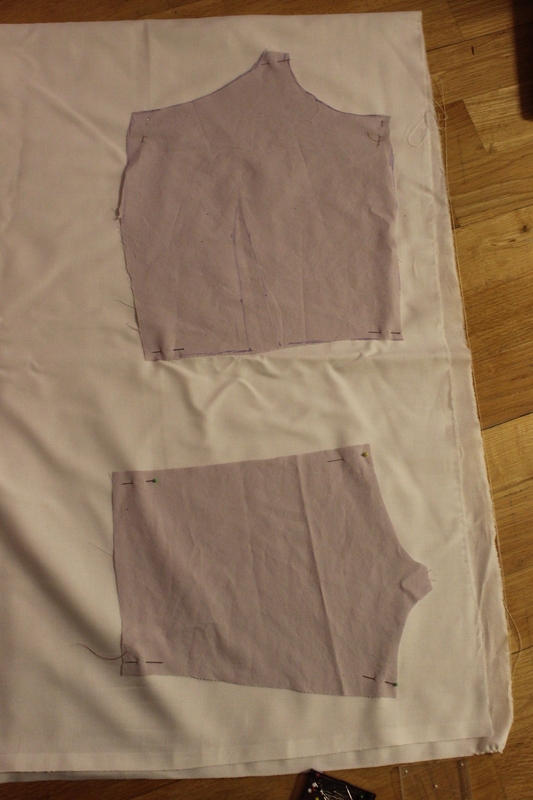 Then I realized I re-set the sleeve in the exact same way as before – INSIDE OUT! I almost burst into tears right then and there. But after I managed to collect myself (a process involving frenetic searching through the kitchen for chocolate and getting some hugs and toothless smiles from my baby) I decided to put the project on hold for the night. 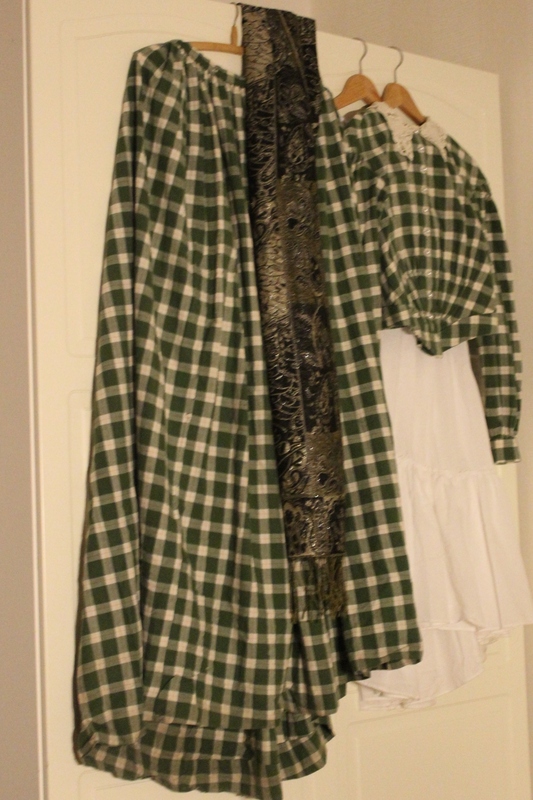 It’s been a while since I last did one of these “layering posts”. 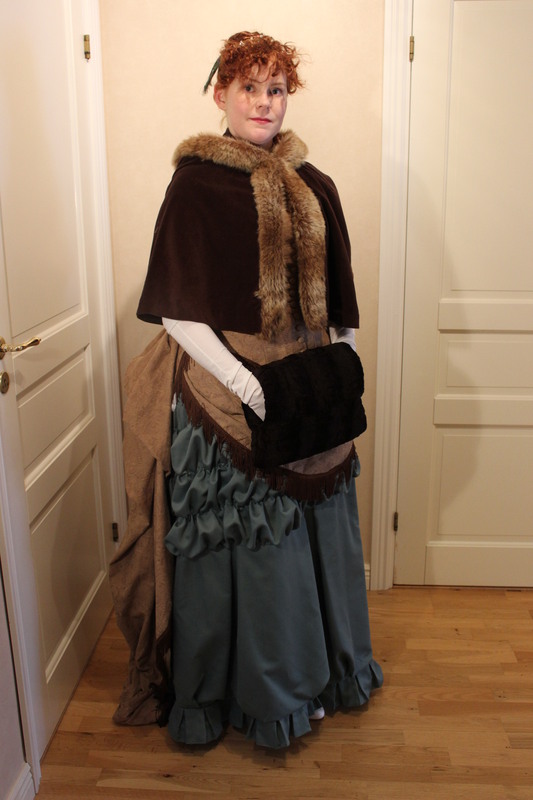 But this weekend when we finished the “winter fur” photoshoot, my sister helped me take a few pictures of the different pieces I wore for my 1900s ice skating costume. 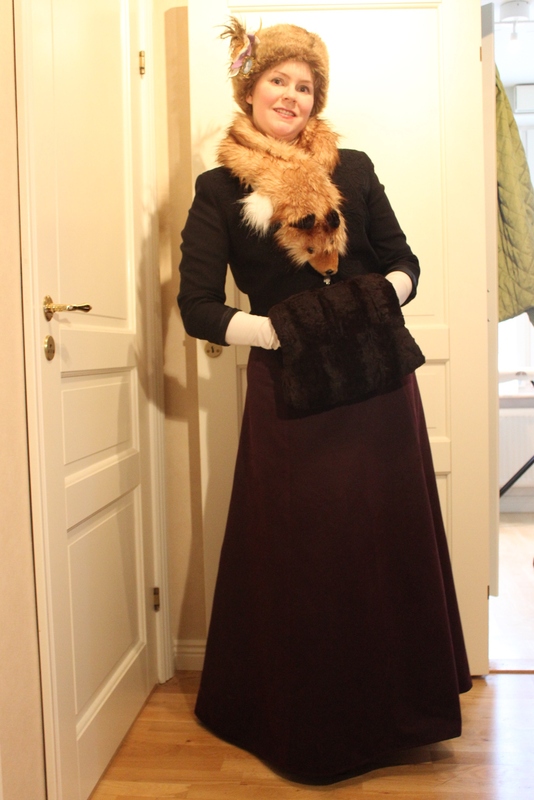 1905s Winter Layering Lets start with the outerwear and accessorize: A fur muff, hat and shawl for cosy winter warmth. 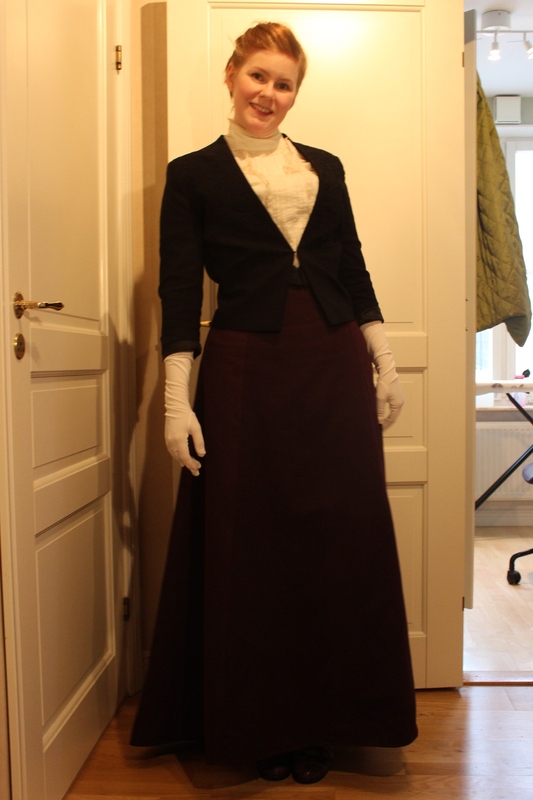 Then there is the short jacket and the long gloves. 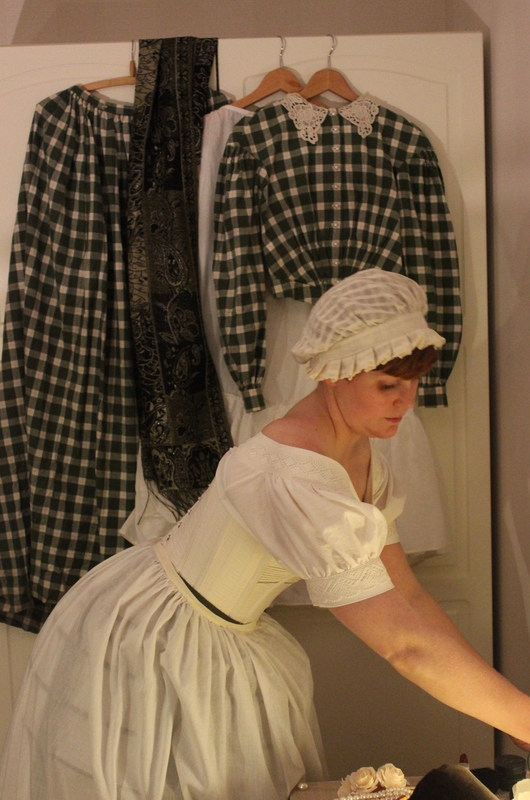 Striping of the outer garments we got an “in-door” outfit, with a high necked shirtwaist, a slim shirt and a Swiss-waist. 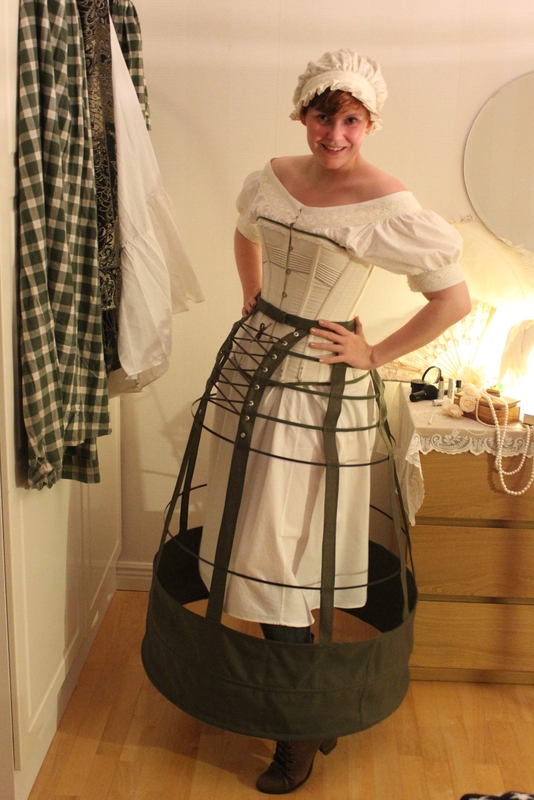 Under the skirt we find the obligatory petticoat. 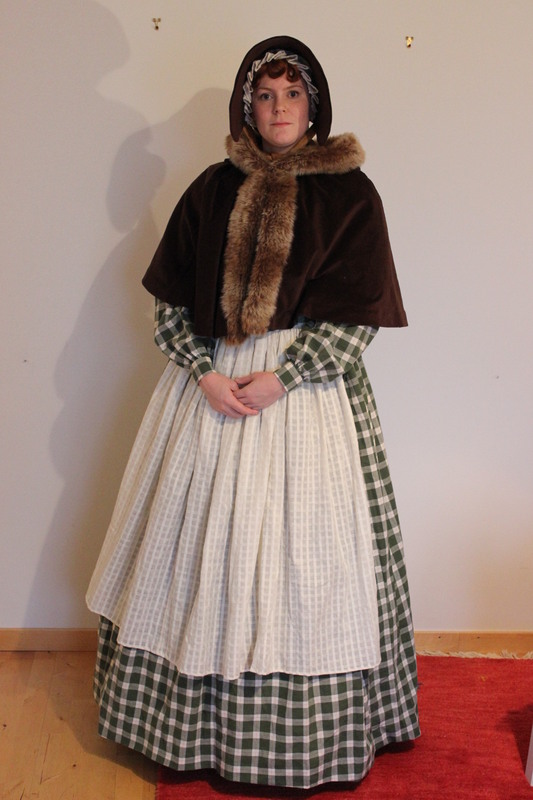 You could use multiple layers of petticoats, and one or to in flannel was not unusual to help keep warm. 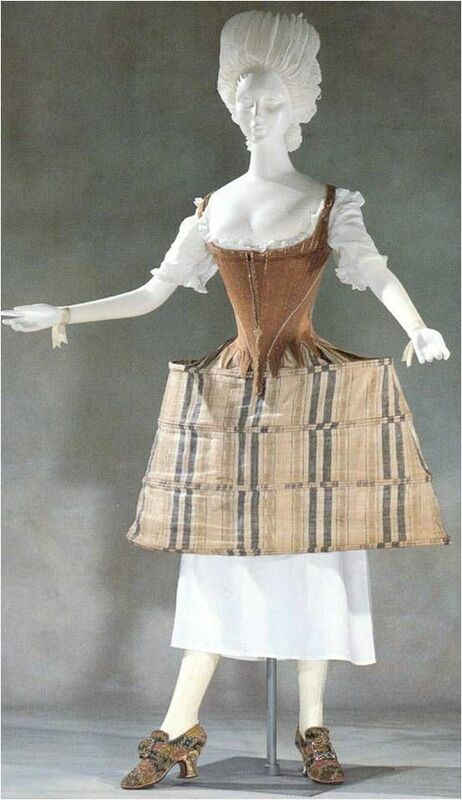 And beneath the shirtwaist we find the corset. and a wool shirt for warmth. 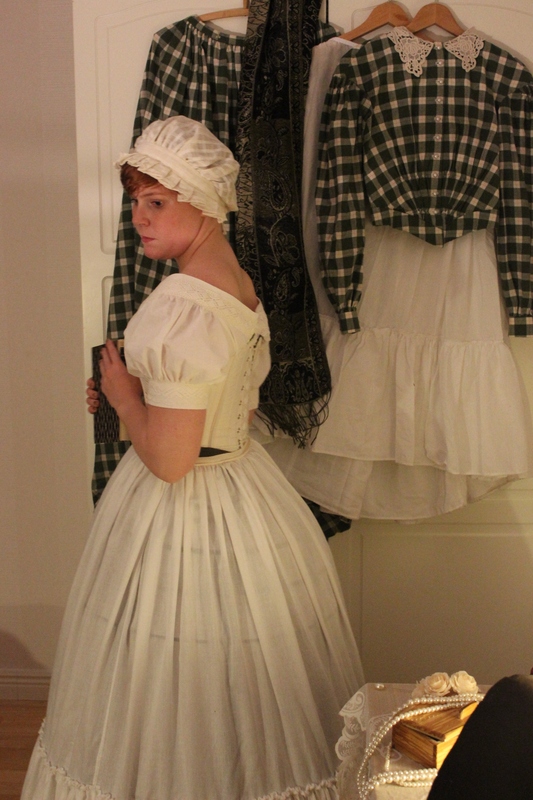 Beneath the petticoat I wear bloomers and high stockings. 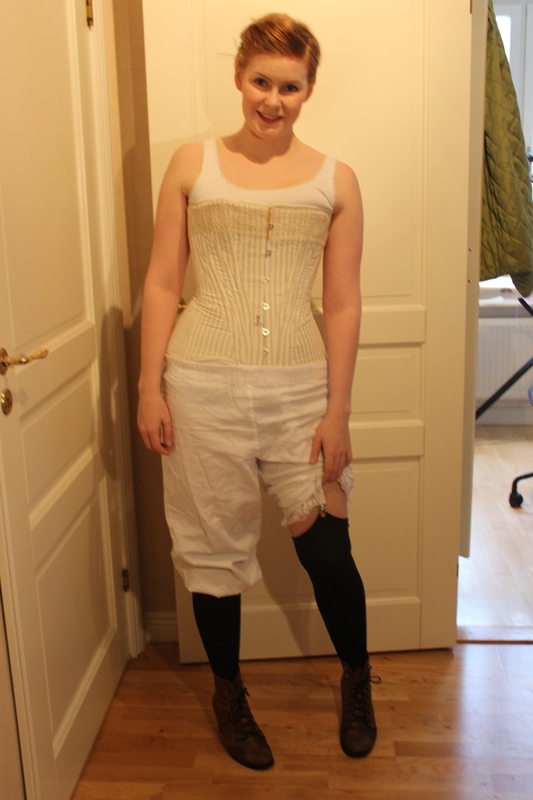 I’m not completely sure of the correct way to fasten the suspenders to the stockings while wearing bloomers, but fasting them on the inside worked pretty well for me, (something that probably would be even more difficult if you’r wearing combinations*). And as usual the shoes are about the first thing on and last thing of. 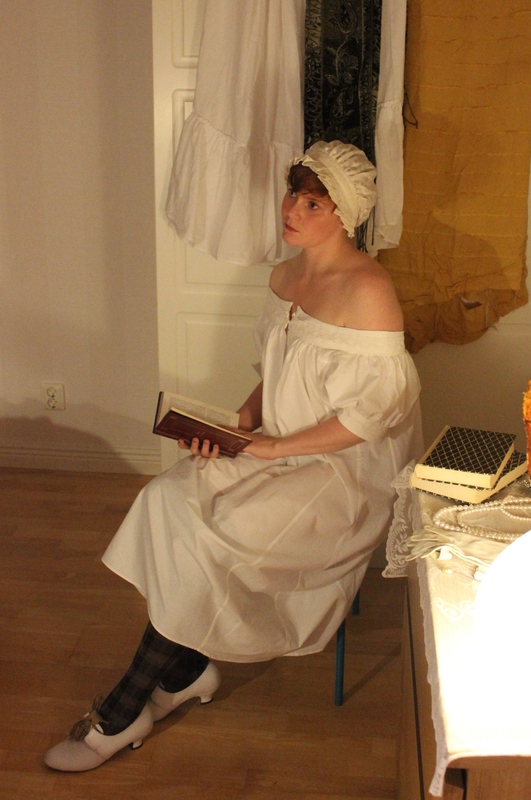 *Combinations, are exactly what it sounds like – a combination of chemise and bloomers, which became really popular as underwear during the late 19th/early 20th century. 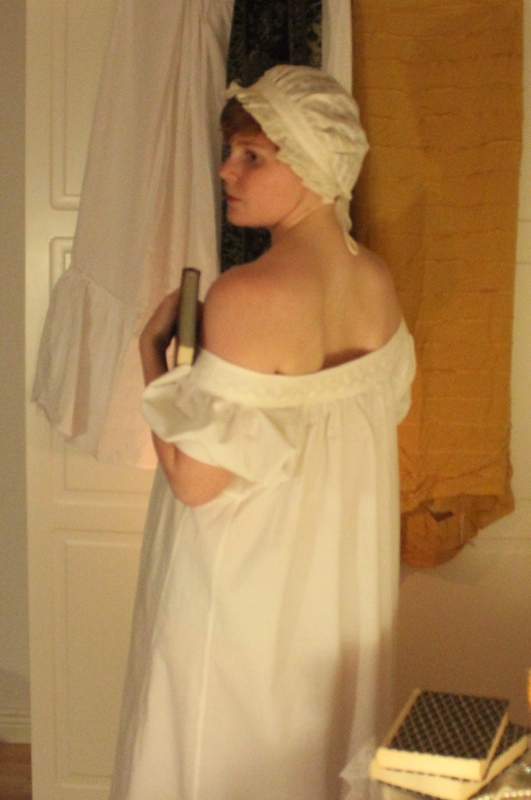 This month on the HSM fare focusing on underwear and foundations. 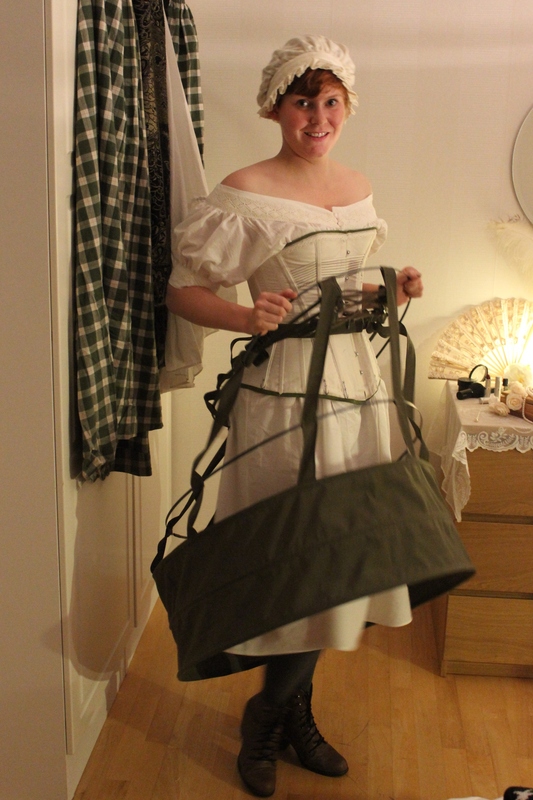 So I thought I make a pair of 18th century panniers. 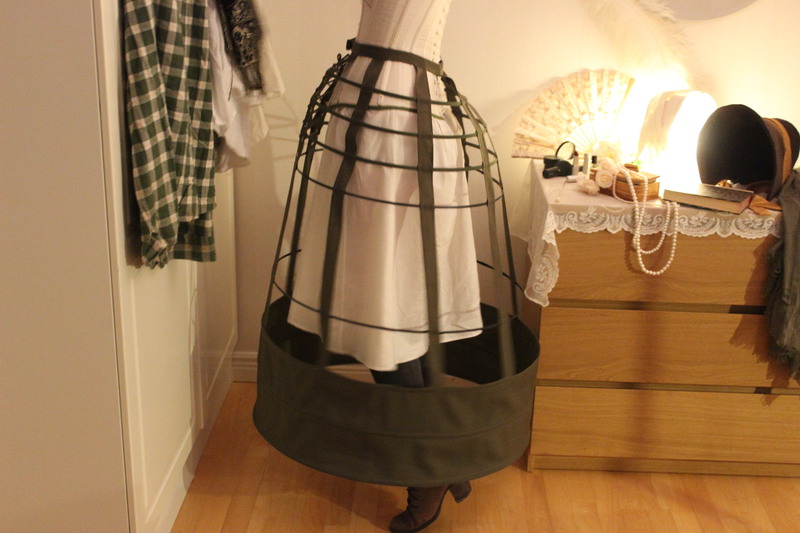 Pocket hoops are good and all, but there are something extra special about panniers. 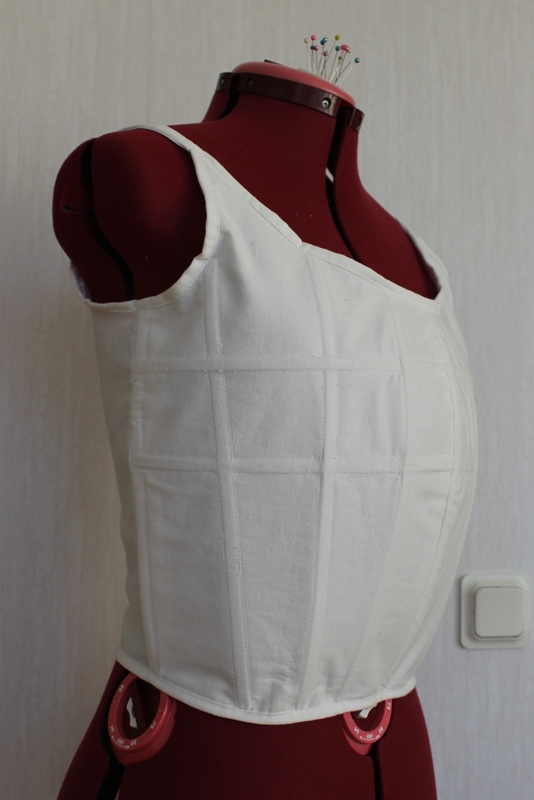 They comes in lots of different sizes and styles, and they all look fabulous. 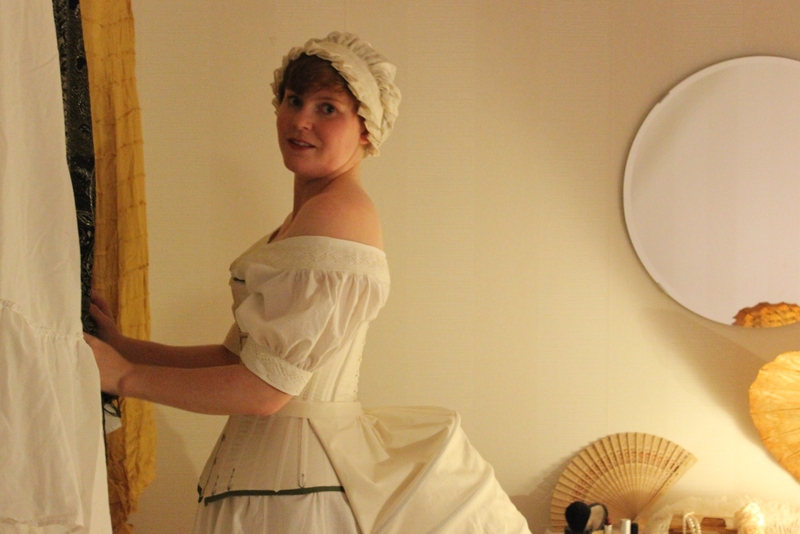 Last weekend after finishing all the 19th century underwear for the HSF 12 and 13, I talked my boyfriend into helping me take som photos. He agreed on condition we waited until there were breaks in the fotball games on Tv. This turned the photoshoot into 3 hectic periods of shooting and then 45 min of down time in between (where I took the time to change clothes and re-arrange the settings), making the whole process drag out through the evening and not being finished untill midnight. 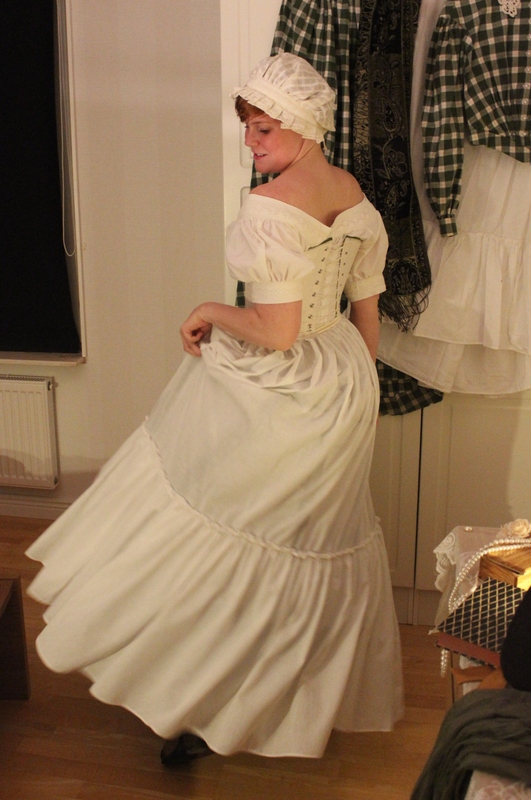 Anyhow here it is – And a warning: This is a picture heavy post. 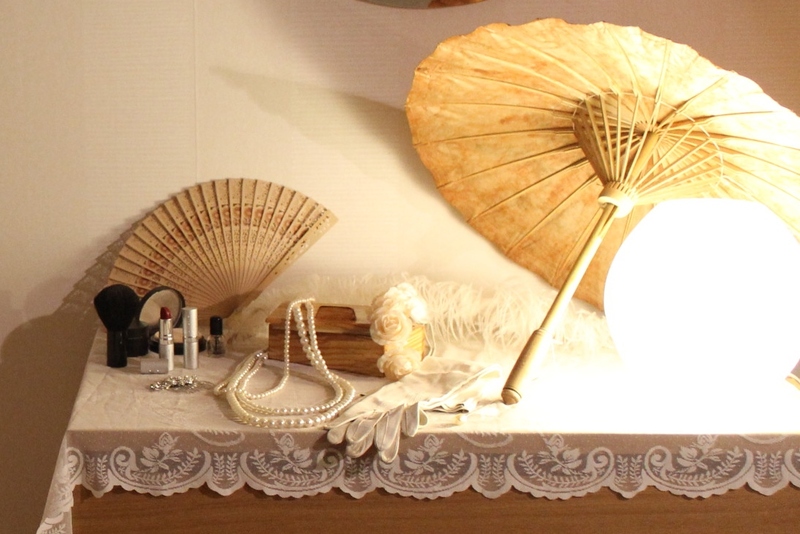 I started by arranging some settings in my bedroom. 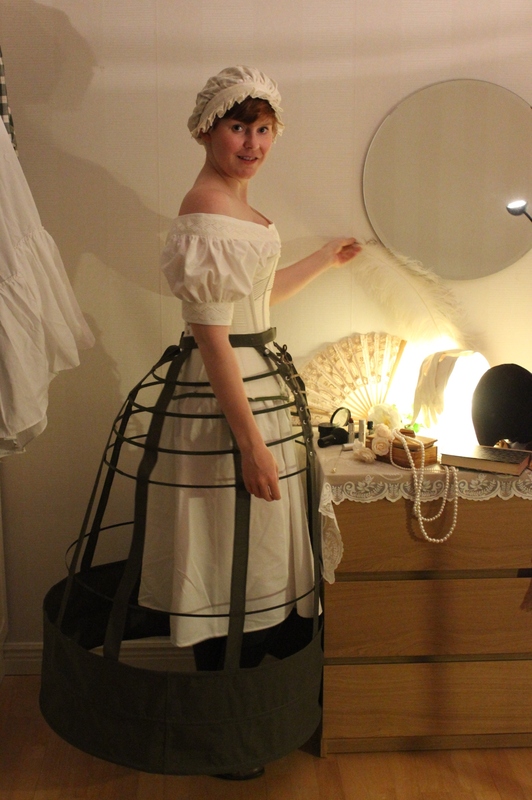 Shawl, petticoat and skirt. And some boxes, juwvelry, glowes nad fans on my drawer. Then we were ready. 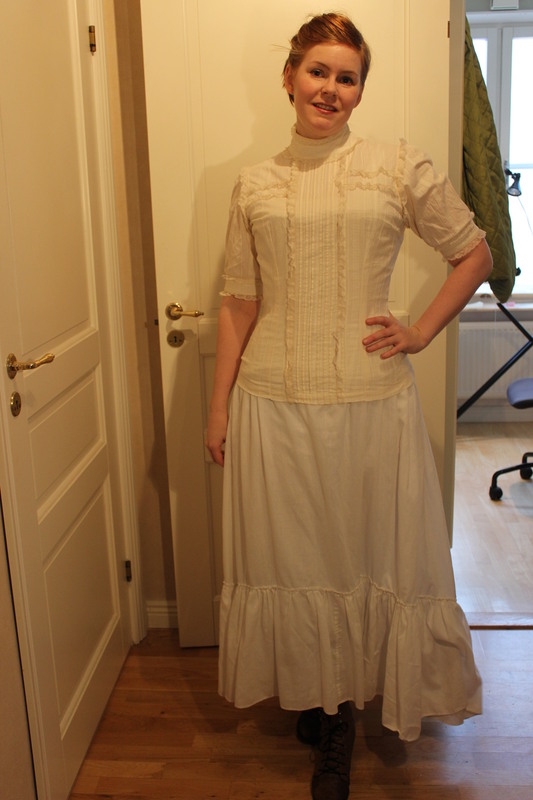 Starting with the 19th century chemise. 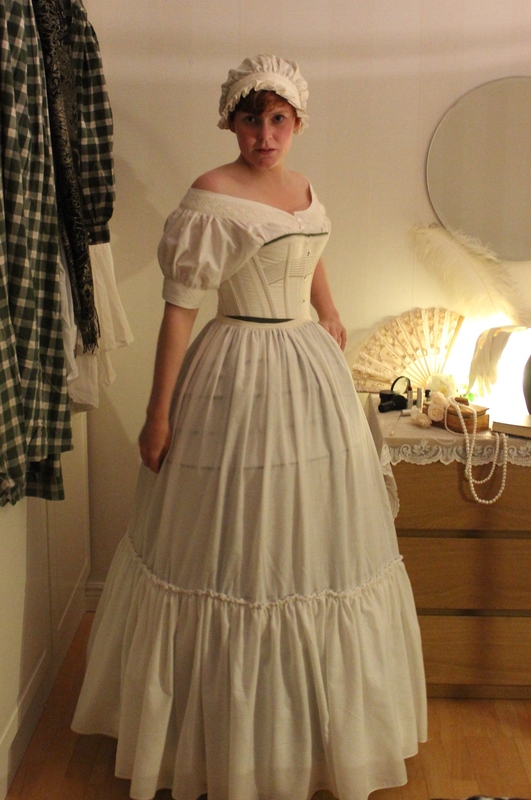 Then I put on my 19th century corset and the new 1880s bustle. 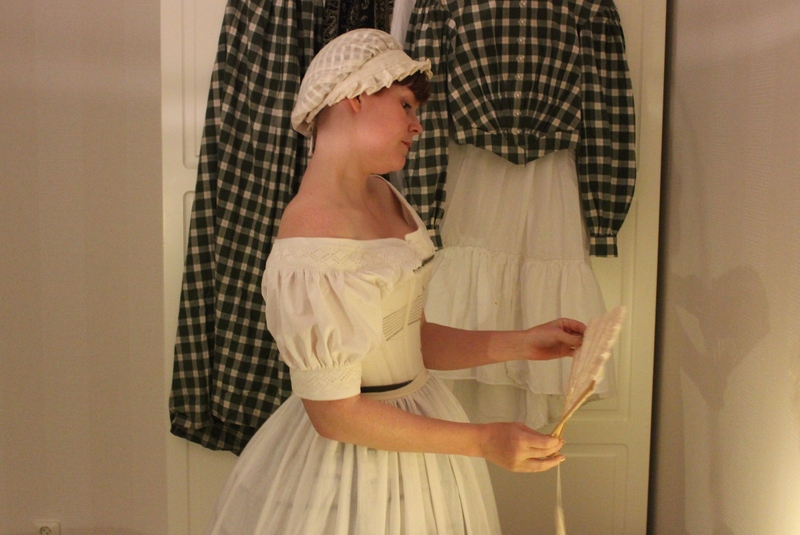 Then it was time to re-arrange the settings, and time tavel back another 30 years to 1850s. 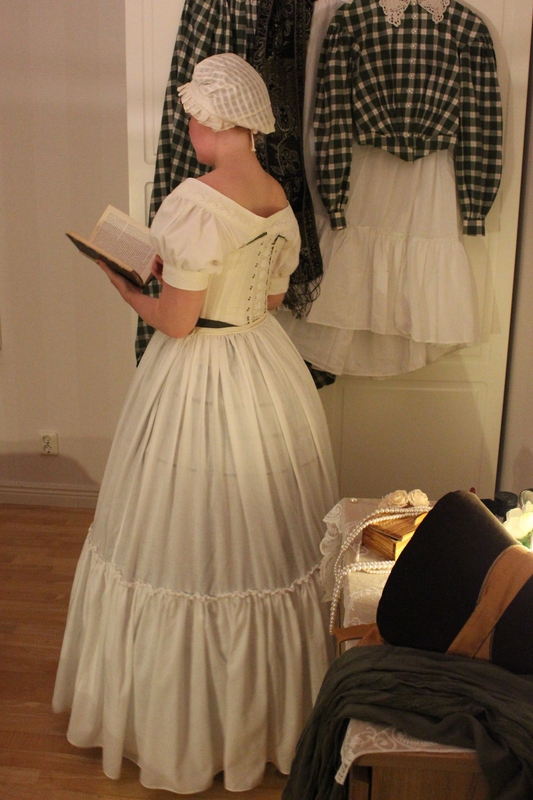 I hung my plaid green 1840s dress combined with a shawl and petticoat on the wardrobe door. 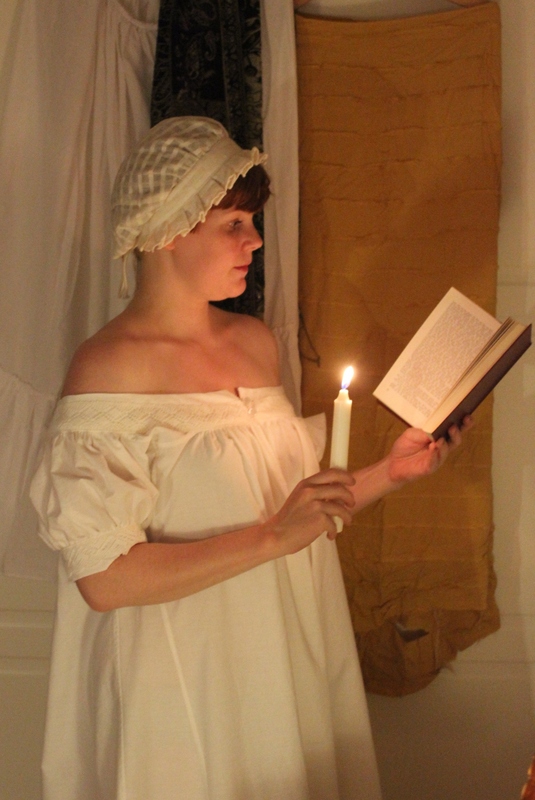 And placed my 1840s velvet bonnet on the table together with a lace fan, some faux flowers and juwvelry. 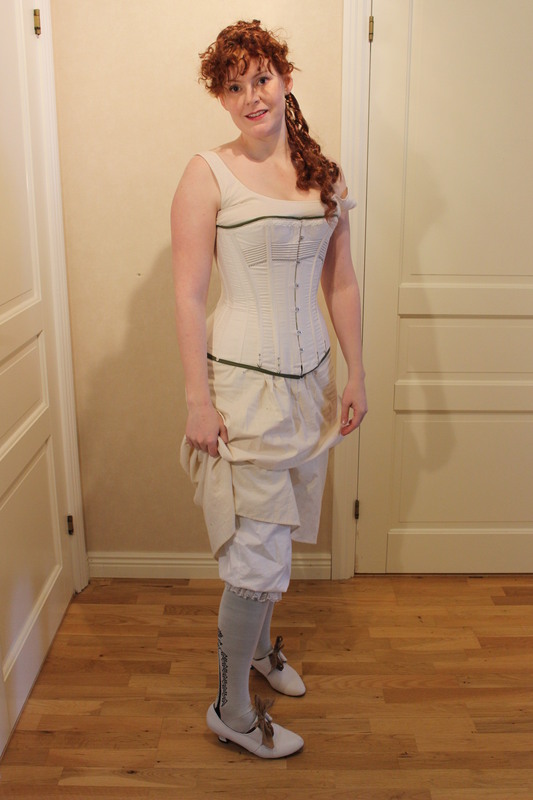 I keept the basic underwear like chemise and corset, but changed my shoes and stockings. 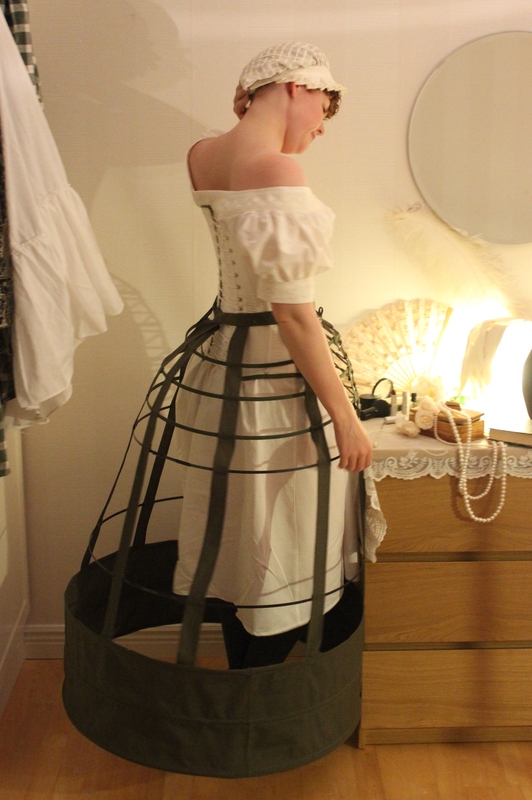 And then I put on my new 1850s cage crinoline. 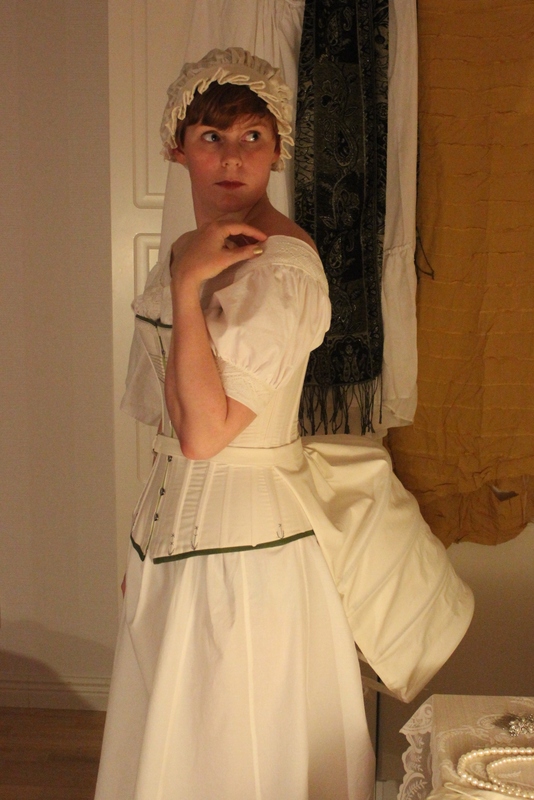 And lastly I put on my new cotton petticoat. 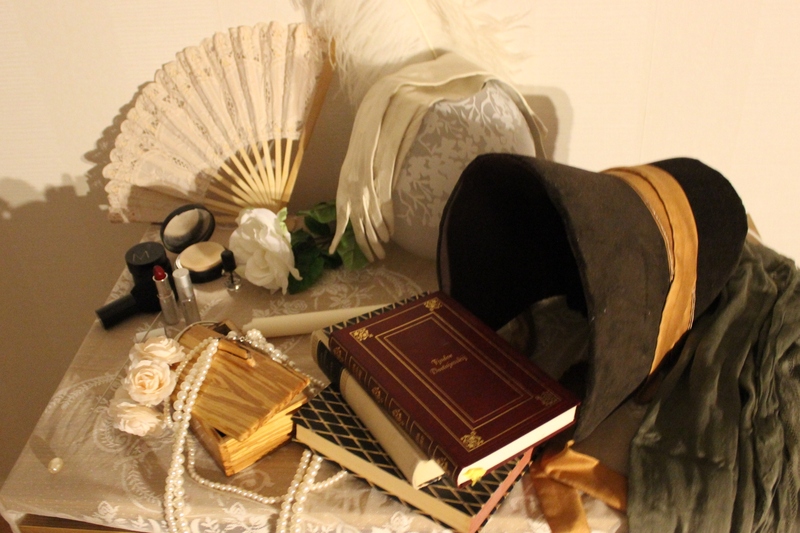 So there you have it, 4 HSF items in one photoshoot. 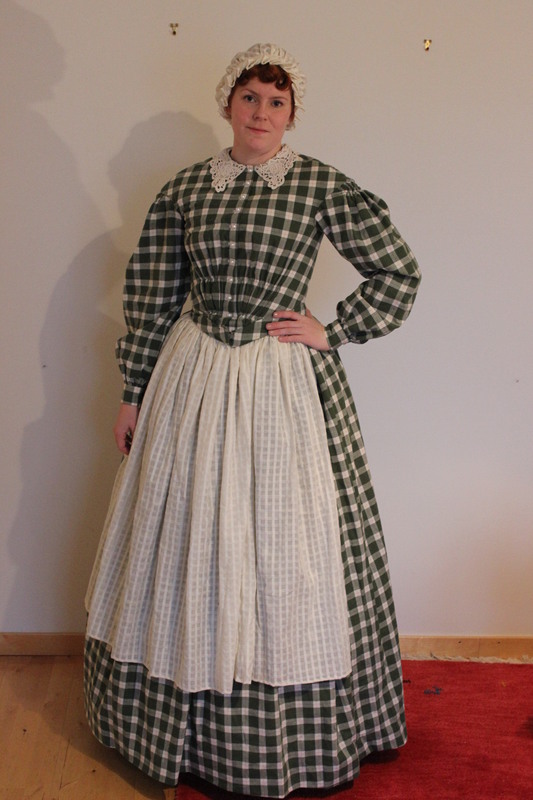 Well actally the corset, brown bonnet, and green plaid dress are HSF items as well. 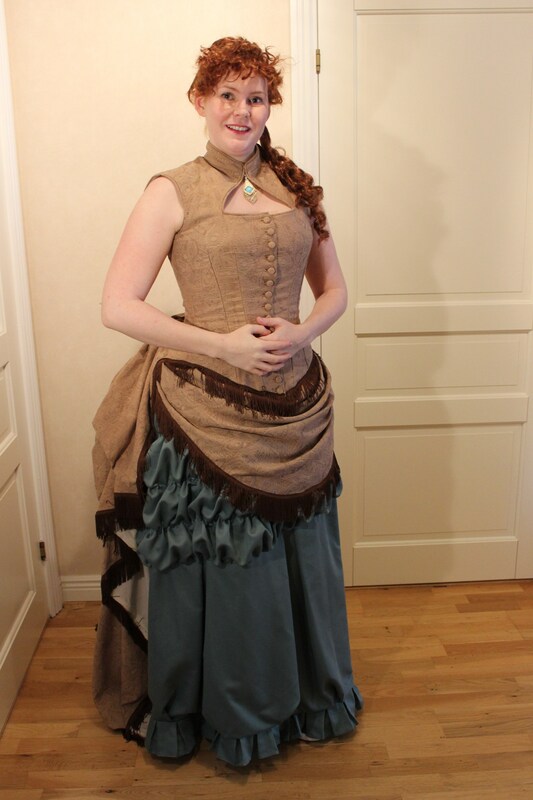 When I had finished the Corset Cover for the HSFs 5th challenge – Bodice, I decided to make yet another entrance. 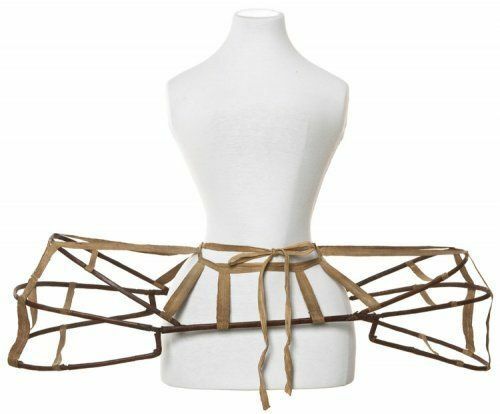 I’ve been thinking of making an Edwardian Brassiere for quite some time, thinking they look both funny and nice at the same time. 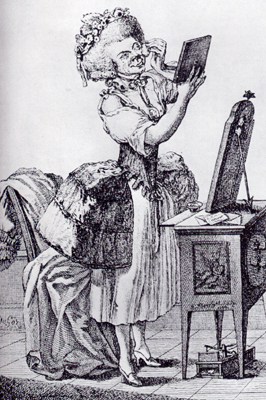 And being sure it would help give that strange S-bend shape and pigeon bust of the early 20th century, I decided now was the time. 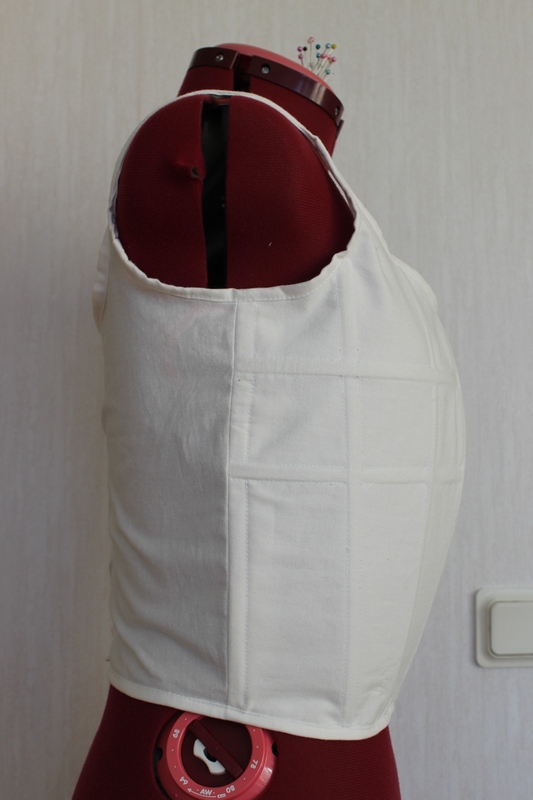 Since I didn’t had any pattern I decided to drape one one my dressform. 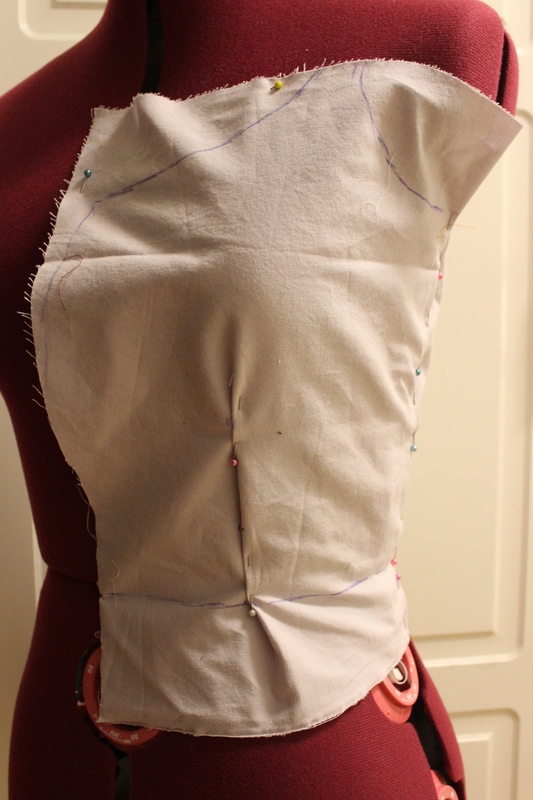 In the end I decided to get rid of the front dart, taking out the width in the side seams instead. 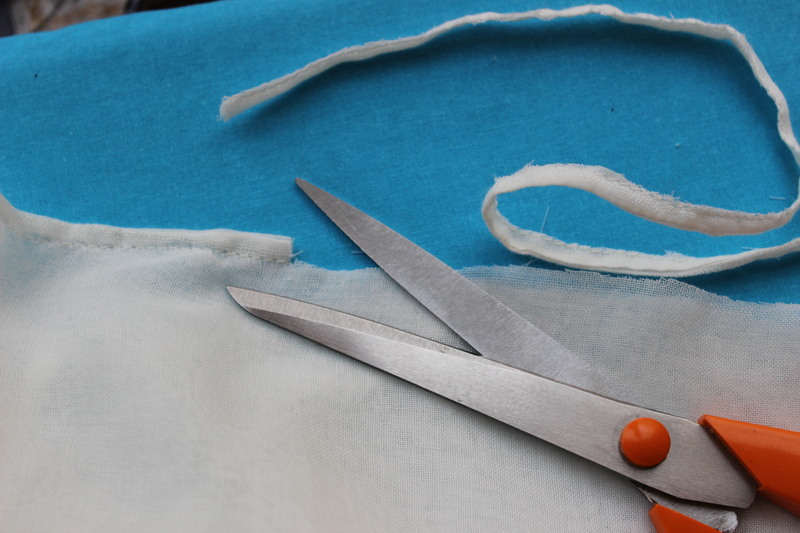 Cutting the pieces from a regular cotton sheet. 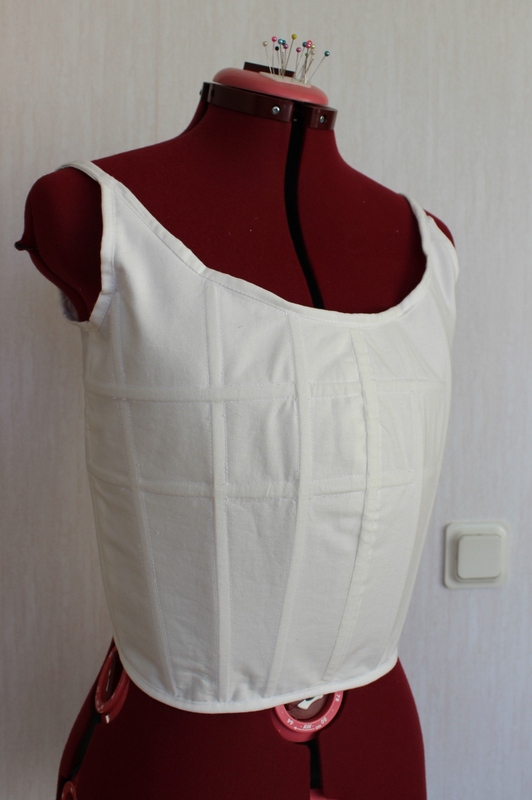 I cut the front piece in dubble layers and basted them toghether. 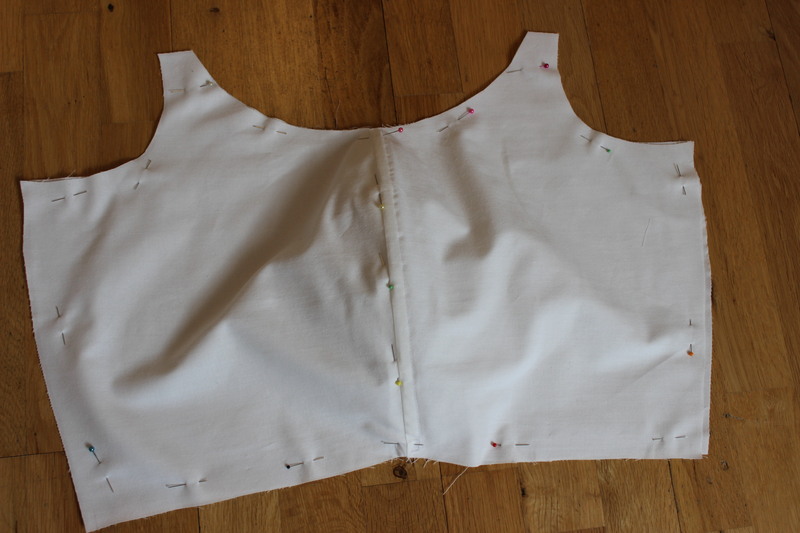 Starting on the boning chanels. I placed the chanels like in my inspiration pic, and stiched them using the “little metal thingy” to get nice and even spaces in between. 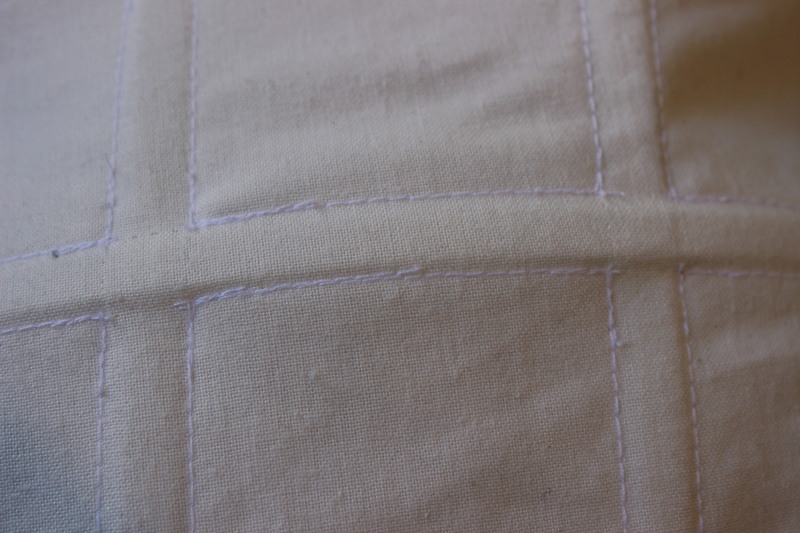 After finishing the crossing chanels, I restitched the outer corners of the cross using smal stiches. 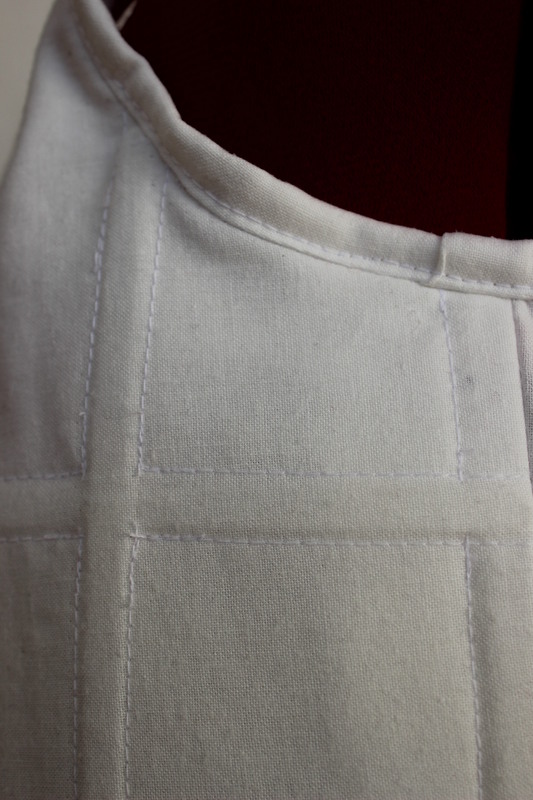 And then removing the stiches inside to make nice crossing boning chanels. 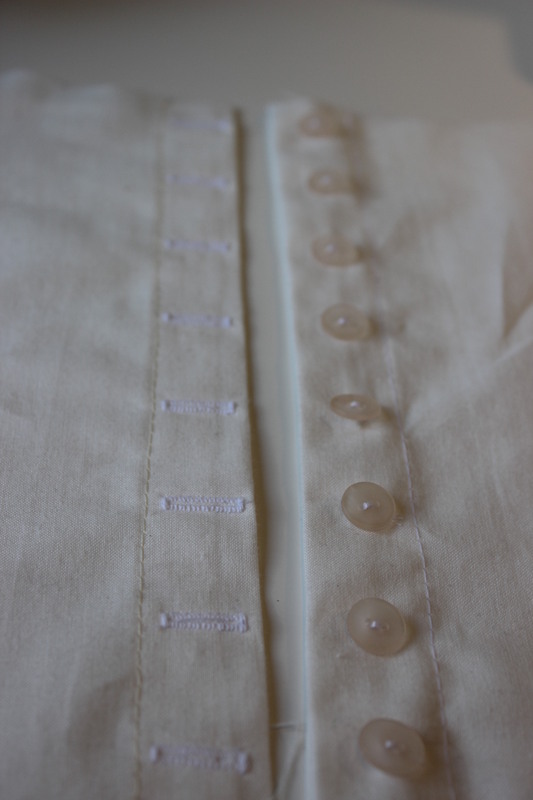 Then I made the buttonholes and put on the buttons. 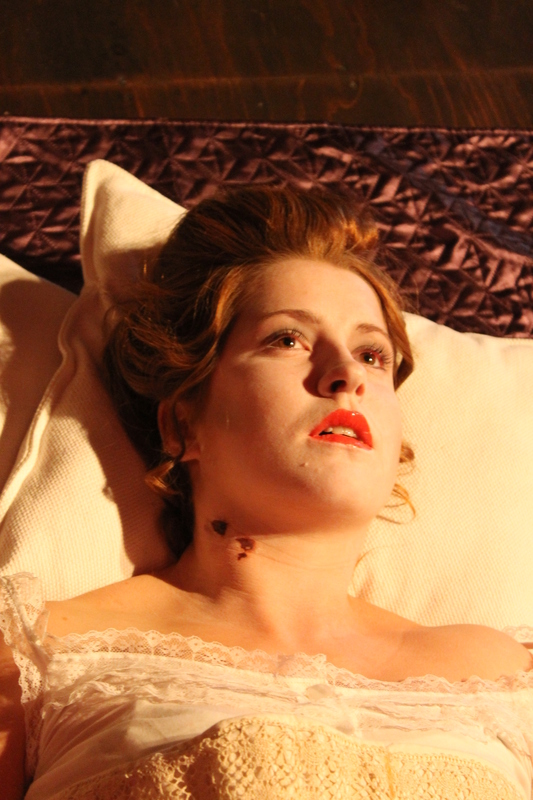 Brassiere laying flat on the floore. 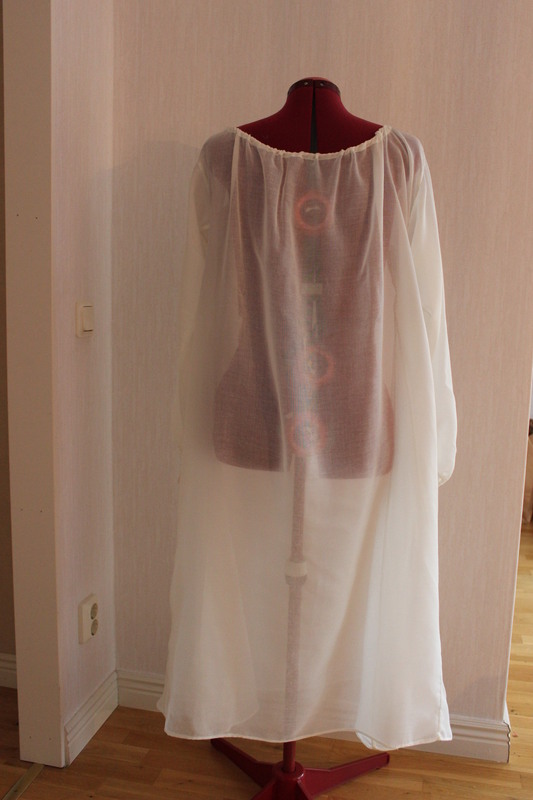 Pattern: I draped my own. 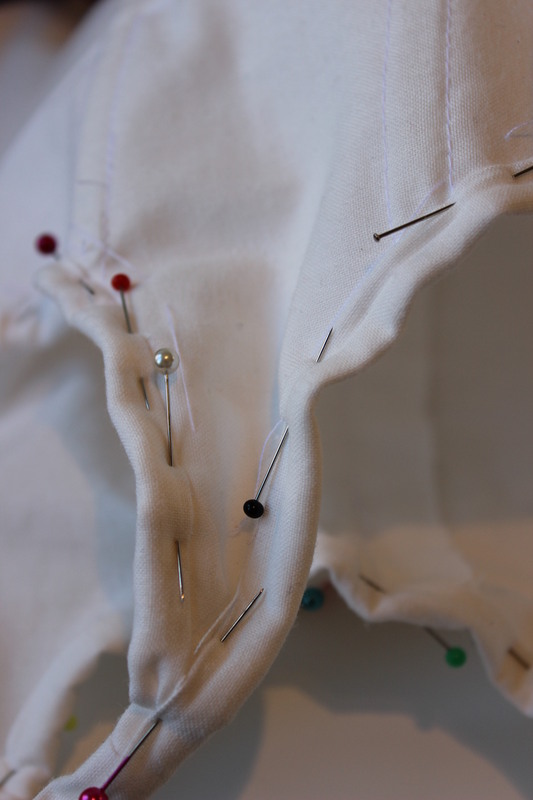 Notions: Thread, 3 m self made biastape, 7 buttons and 5m syntetic whalebone. 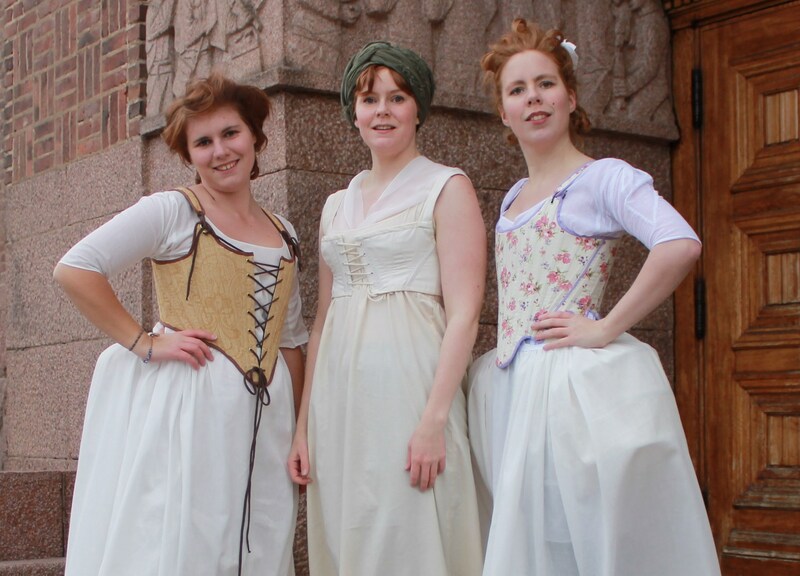 Historical accuracy: It’s okay. The “pigeon”shape is not as dominant as it should be, but other than that it does look the part. 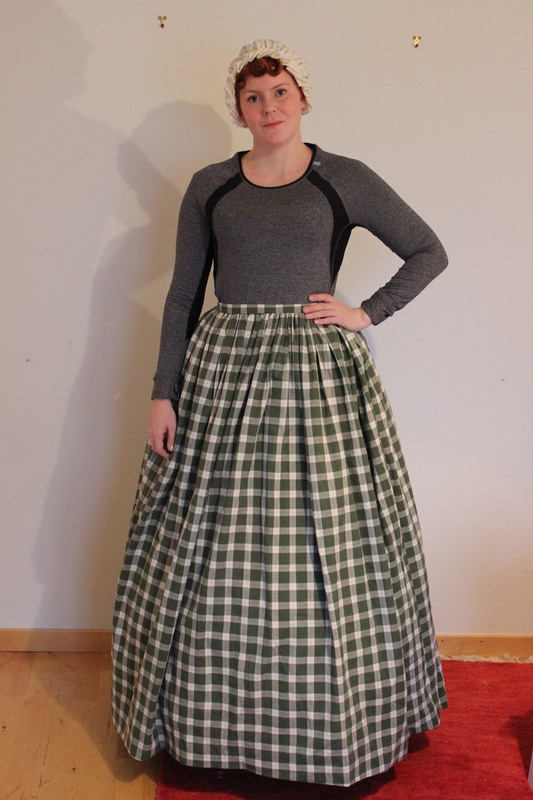 Final thoughts: I’m already thinking about going back and rework it a bit – shortening the sides 1-2 cm and making the whole thing a tad bigger, to get a better fit. 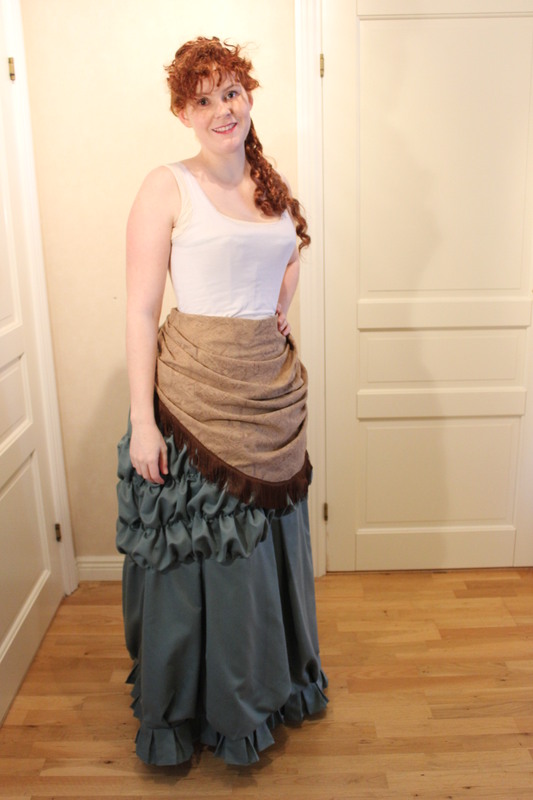 Other then that, I think it looks really nice and I love that it went together so easy. 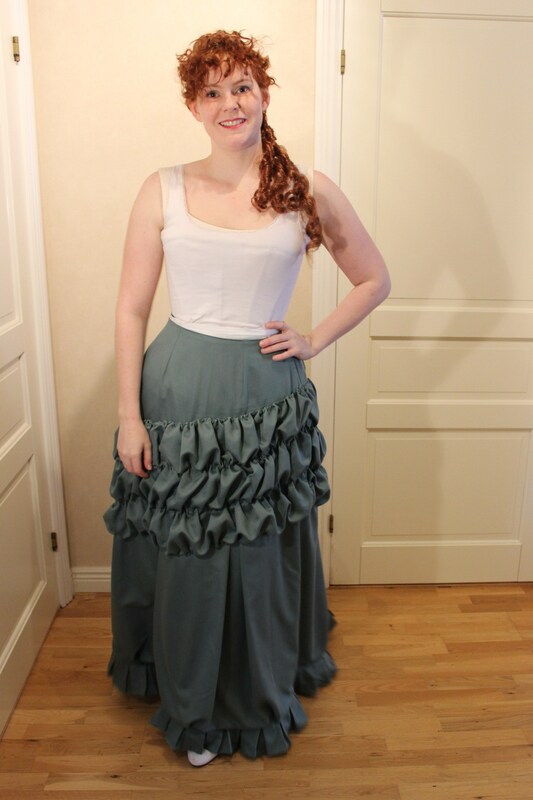 If you been reading my blog you would know about the 1880s evening gown I made for the bal at the opera late january. 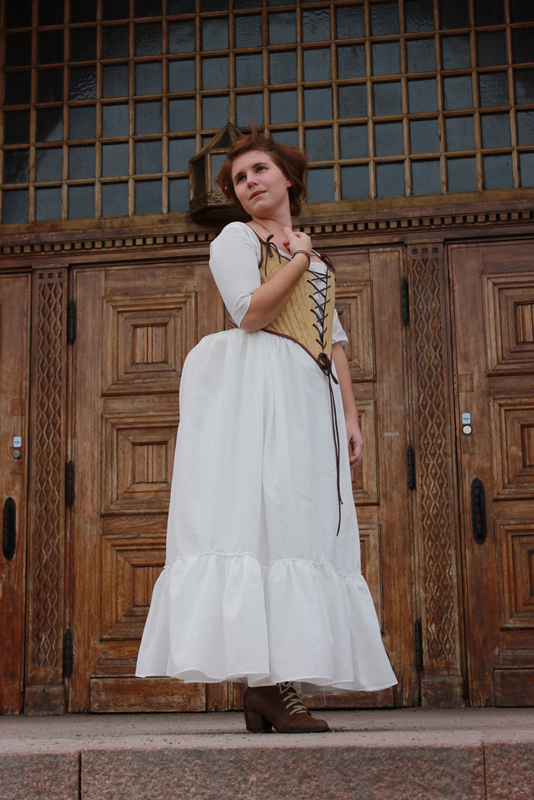 You might also know all about the underwear, corset and petticoat I struggeled to get finished in time for the event. 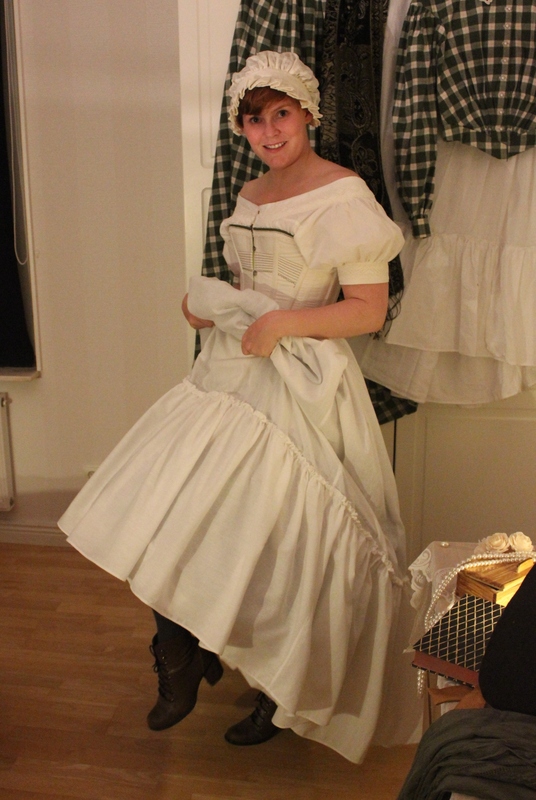 But I thougt I would show them again in a more structured way. 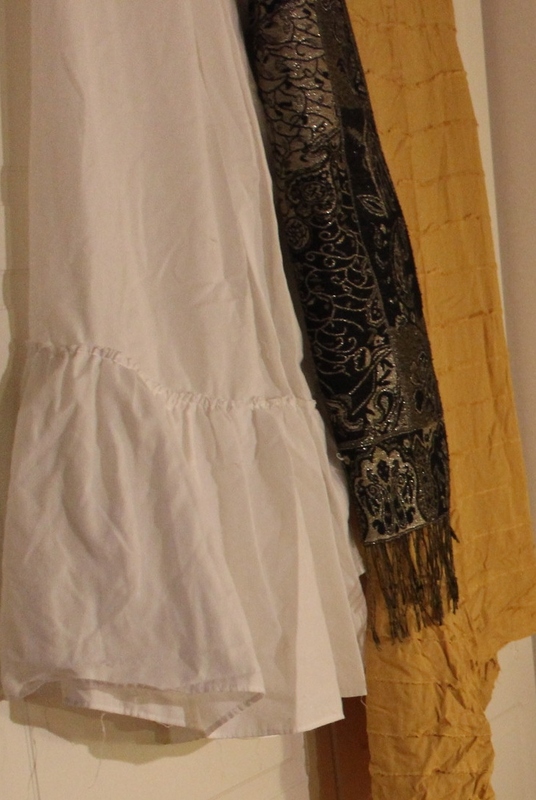 So today on the “Layering series” (I already done: 1750s, 1810s and 1840s) I will show you all the clothing of a Victorian ladys evening attyre. 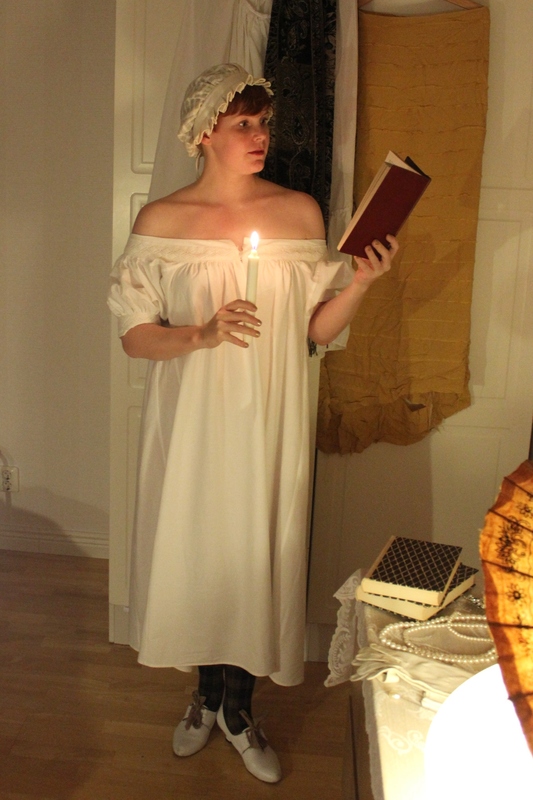 As always we begin fully dressed in gown, cape/cloak and muff. 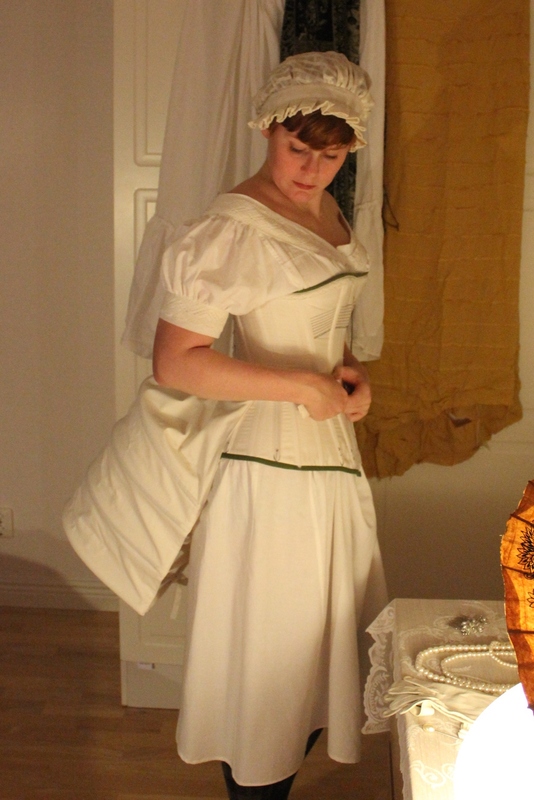 Then we remove the outerwear, to find the evening outfit compleat with glowes, juwelery and fan. You might also be carrying an evening bag or some other accessories. 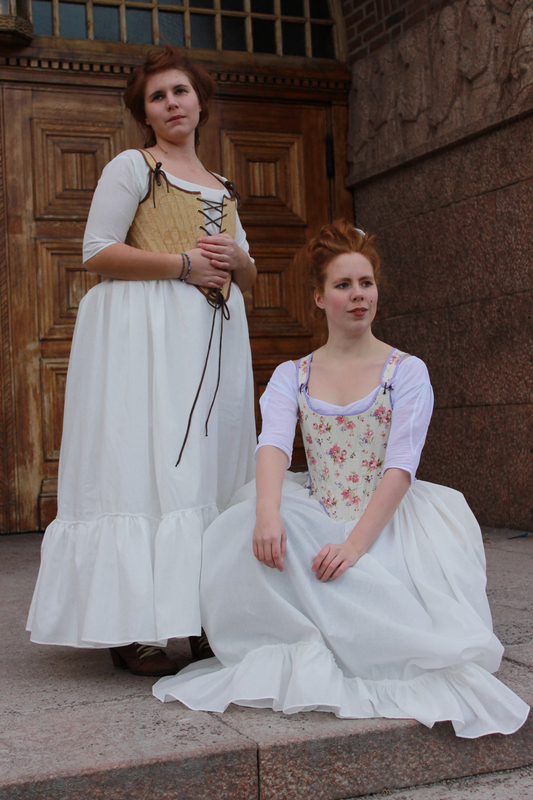 Removing the accessories we are still fully dressed in our tight fitting gown. 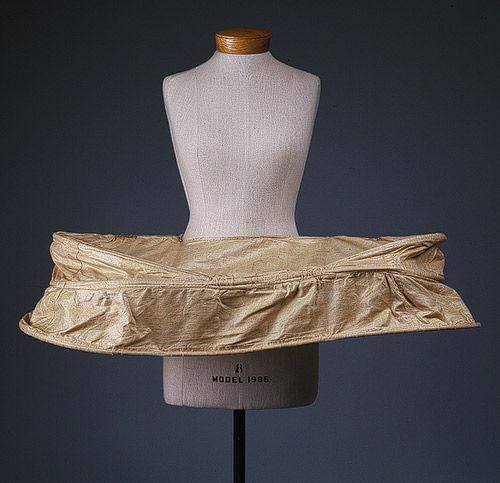 The train is almost mandetory for evening gowns, but not worn on everyday dresses. 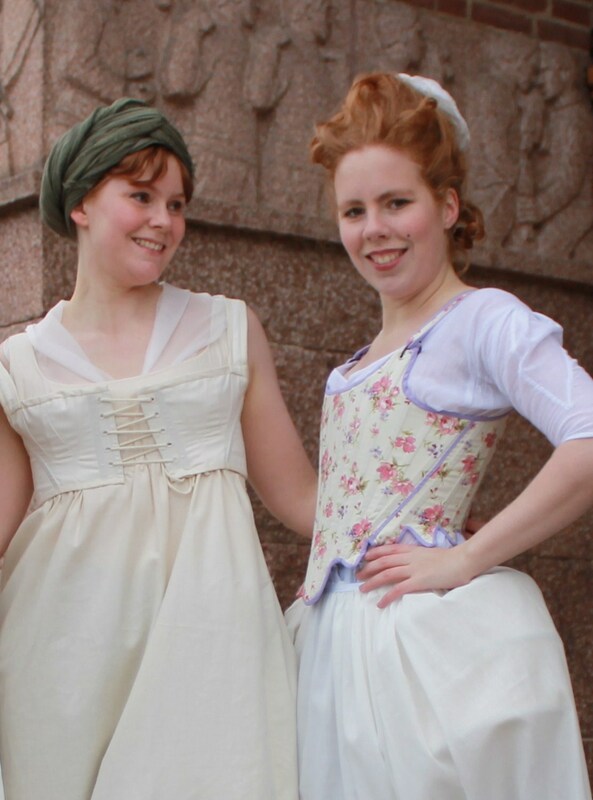 Then we take of the gowns bodice (in this case the bodice are attached to the train, in other gowns the train might be separate and are removed after the bodice), and reveal the compleat apron and some of the corset-cover. 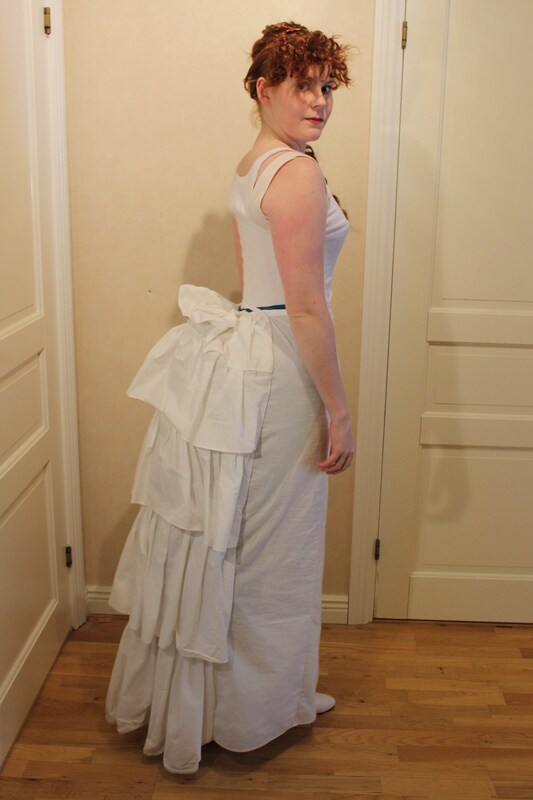 The apron was a nice fashion detail used during the late part of the 19th century. 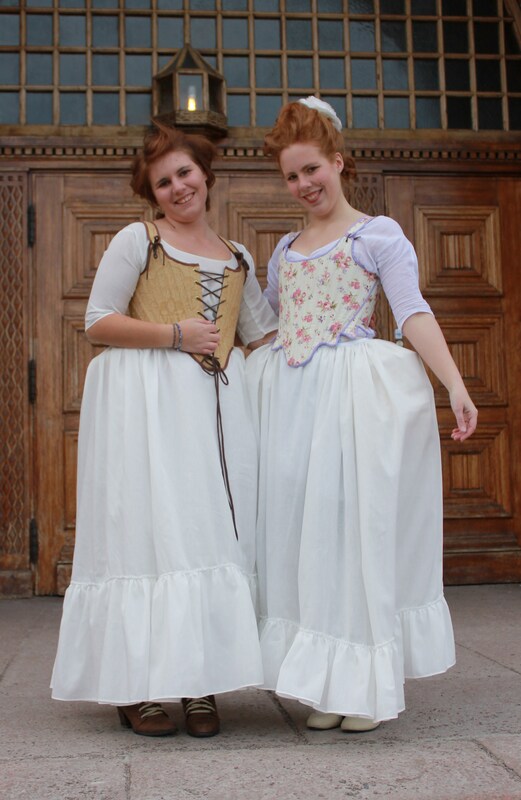 Women wore the apron style both to evening, day and sport dresses. 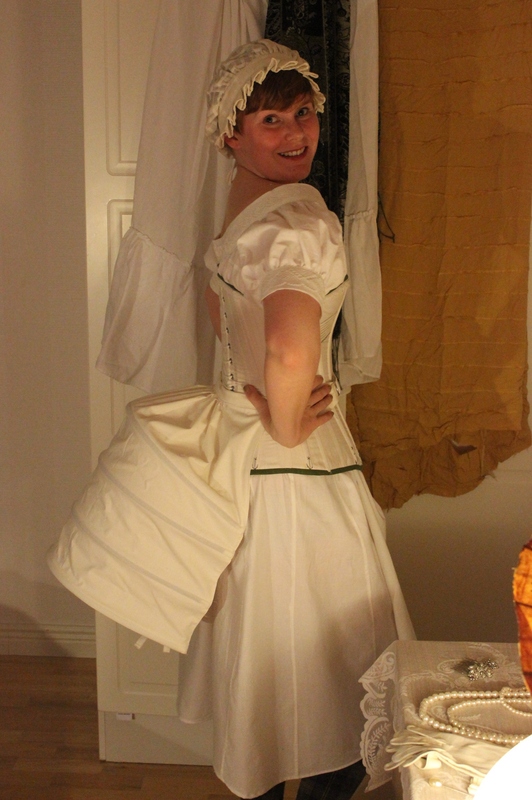 Then we unfasten the apron and get a good wiew of the highly decorated skirt. 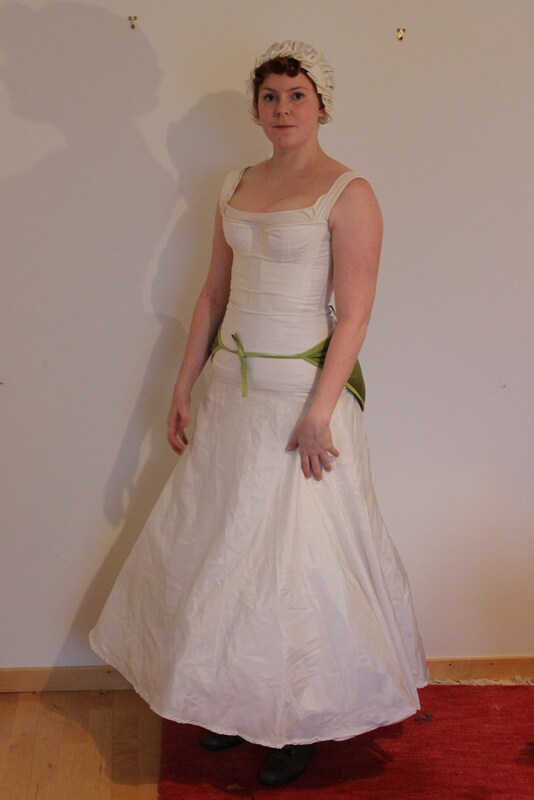 And removing the skirt we find the petticoat with it’s ruffeled backpanel, and the corset-cover – being just a regular tank top at this point (since I haven’t gotten around to make a real one yet). 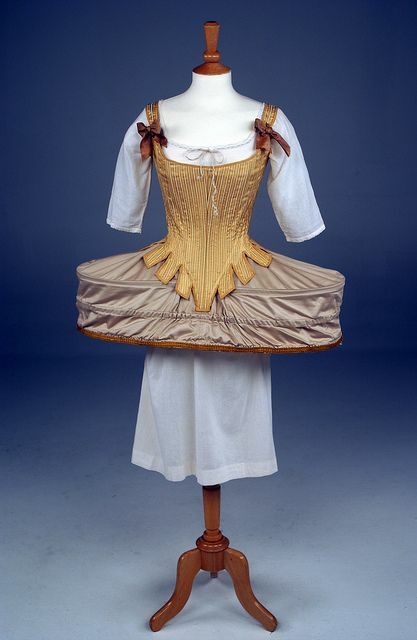 The purpse of both the petticoat and the corset-cover is to smoothen and hide the sharp edges from the foundation wear, and to help give the desired silouett. 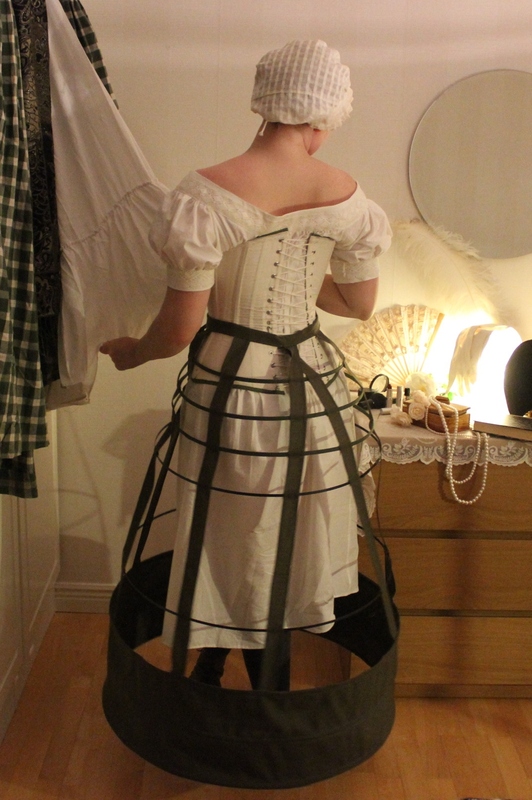 And finaly, after removing the bustle and the corset-cover we find the un-mentionables – the corset, chemise, bloomers, stockings and shoes. 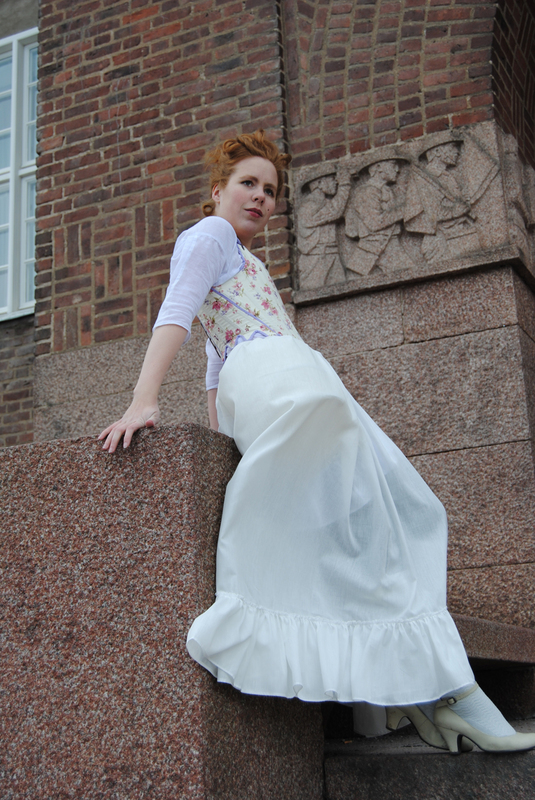 The purpose for the undewear are (of course) to keep the finer clothes free from dirt. 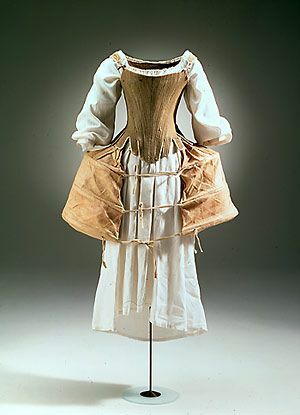 The corset was used to both mold the body to fashionable shape and to give the gown a nice ad smoth base on which to be worn. 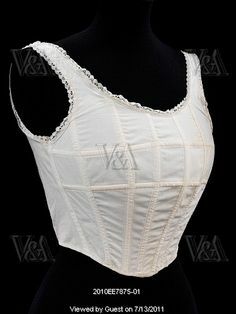 Many people can get quite upset when it comes to discussing corsets, and admittedly some ladys of the victorian age did tight lace, but they where rare exeptions, and most women wore their corsets as bust and back support, and as mentioned, to get a smooth look on their clothes. 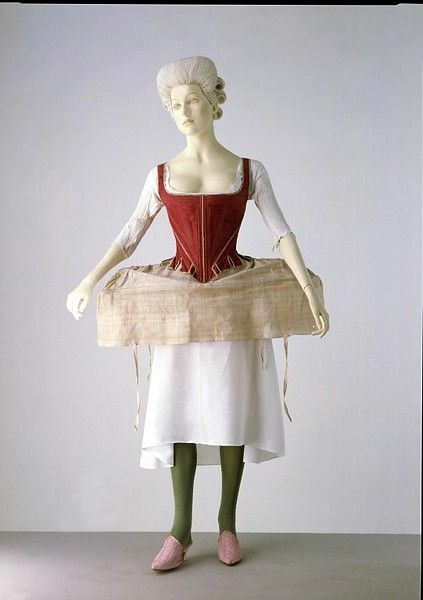 And as you can se it still comes back to the same basic clothing items (underwear, shapewear, gown and accessories) during so manny of the different periods. 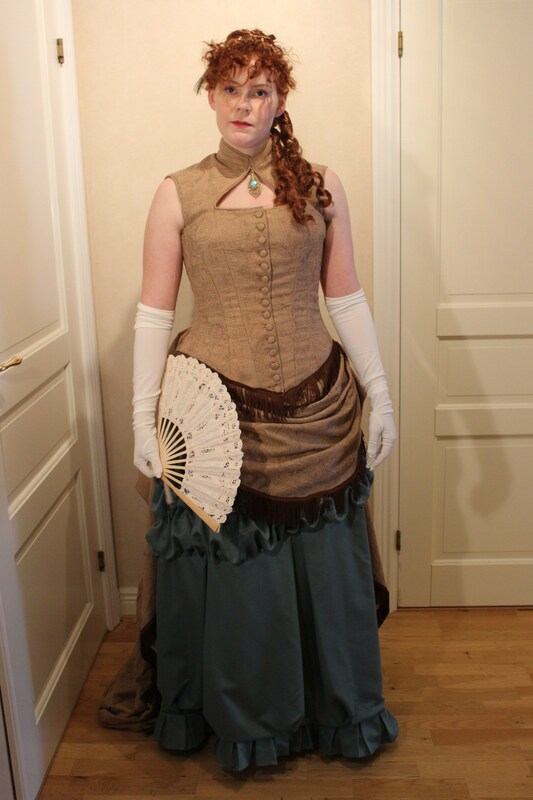 This is beginning to become a series, but I think it is good to show the amount of clothes and layers there is to most historic costumes. 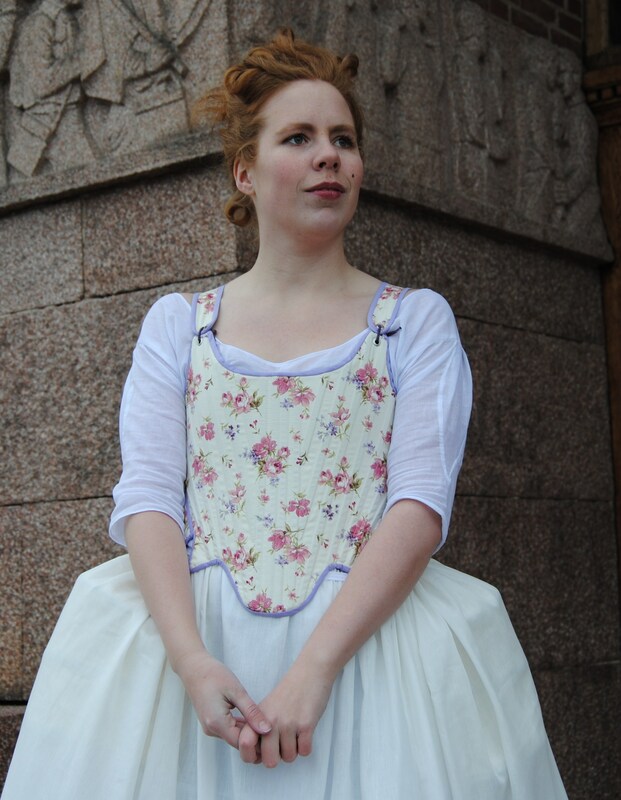 Often you only se the gown and can only guess there are some foundation underneath, but exactly how many petticoats do it take to get that special silhuet, and how do you keep warm during coold winter weather. 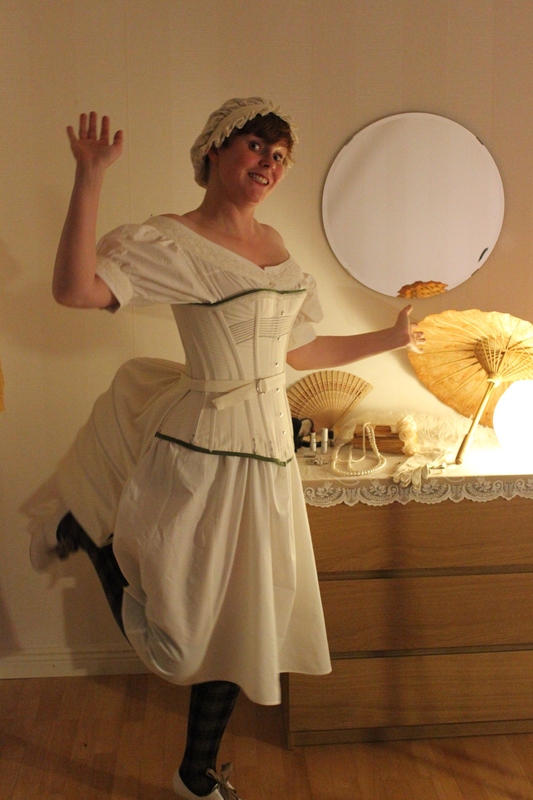 So this time I will show you the different layers of a mid 19th century woman of everage wealth. 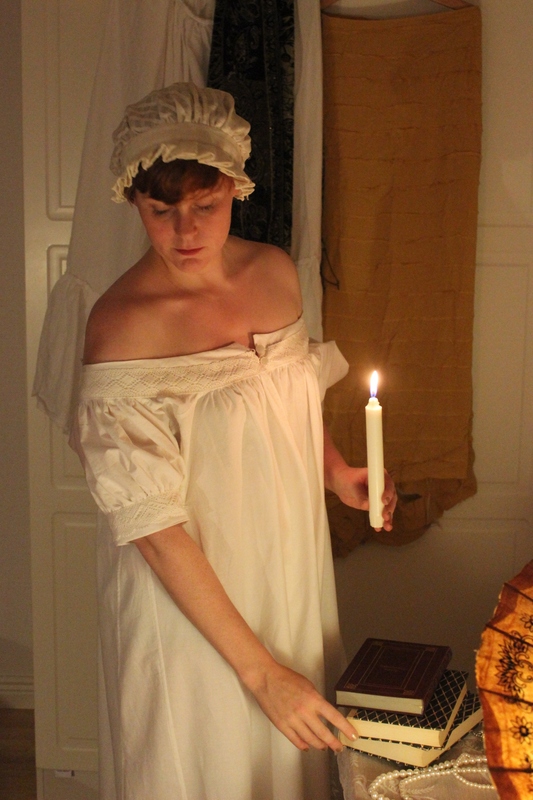 Let’s start fully dressed in: Gown, bonnet, cape and apron. 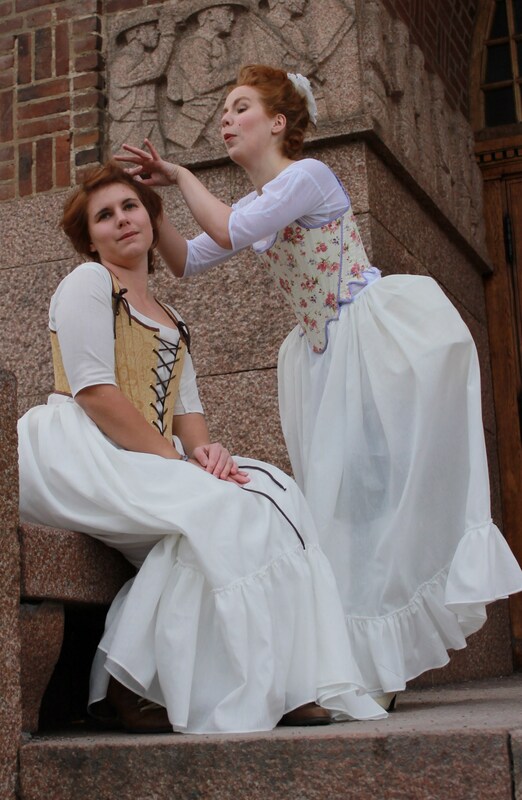 When you remove the outerwear we got more of a indor look in: Gown, apron and coif. 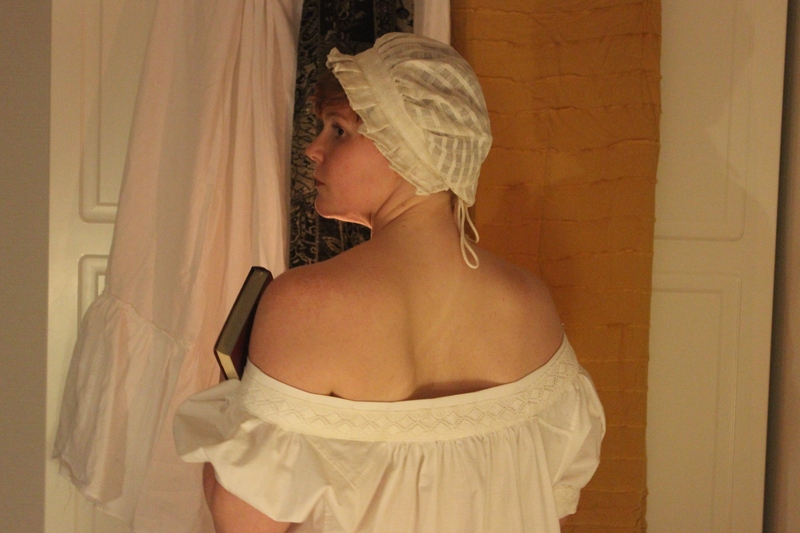 Then we remove the apron and bodice to find a warming undershirt (should be woolen but I make do with ordenary sporting clothes). 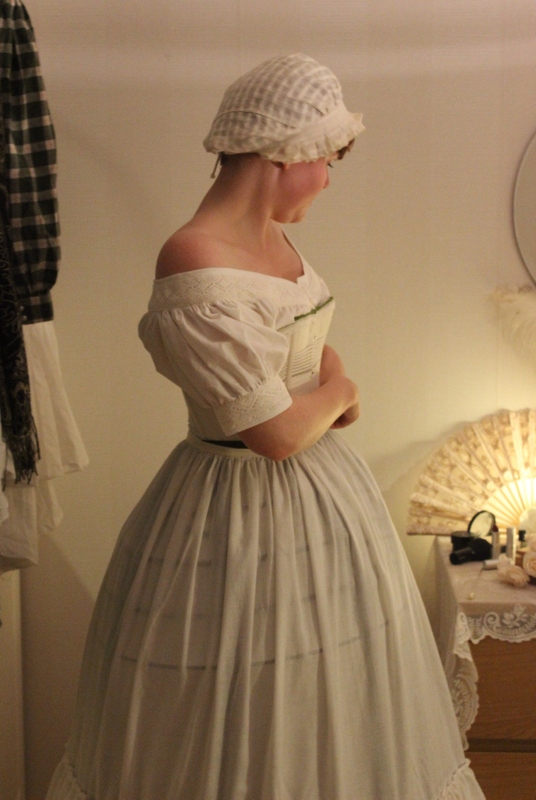 And under the skirt there is a warming quilted petticoat. 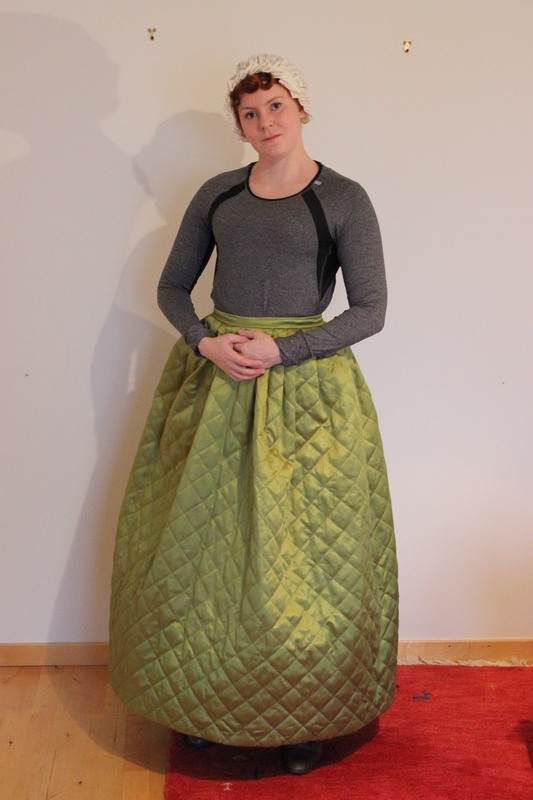 You can also wear additional petticoats on top of the quilted one for warmth and to ad more widht to the skirt. 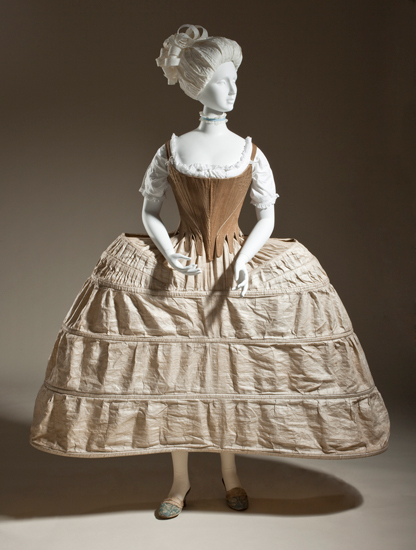 Beneath the petticoats there are a hoopskirt and a bumpad – which both helps the skirt to get the desired shape. 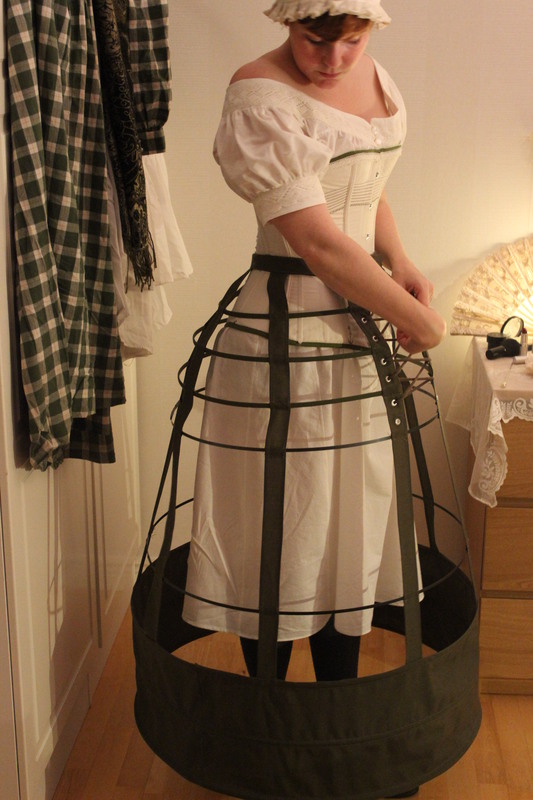 (I use a modern bridal hoopskirt, but you should really use one made for this purpose). 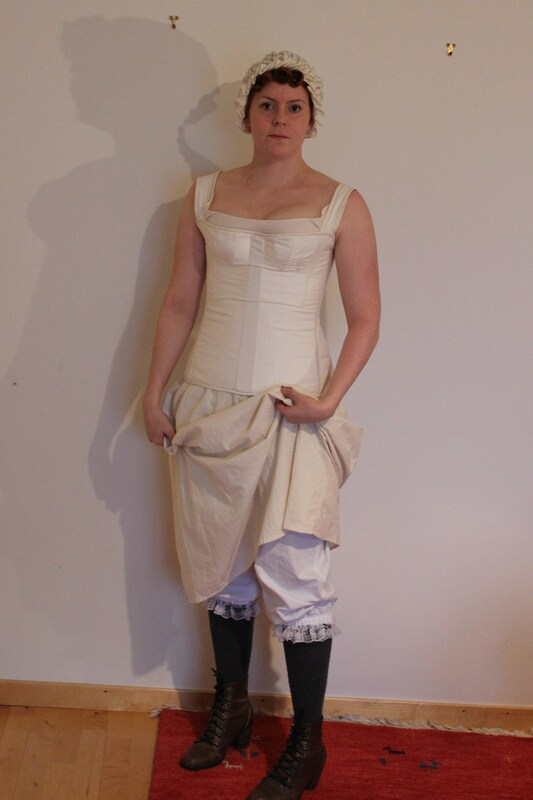 And as the layer closest to the body we find the chemise, the corset, blomers, stockings and lacing boots. 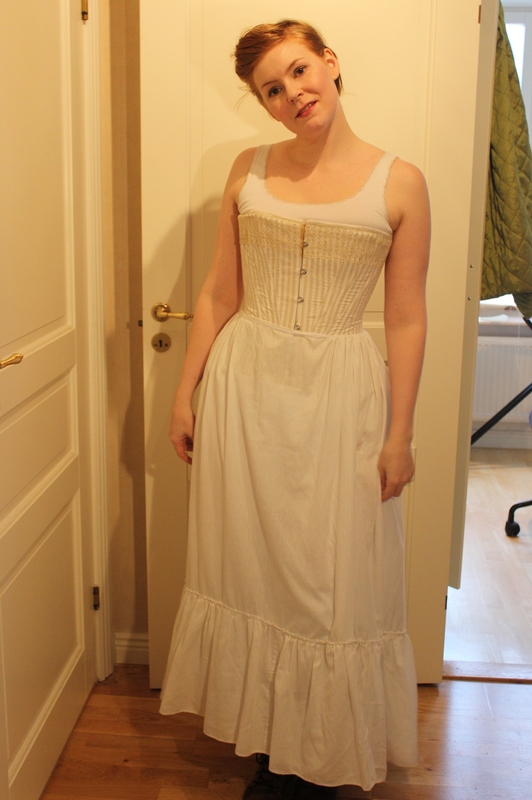 Because the mid 1800s are a relativly new era to me, I’m still in need of the proper corset and chemsie. 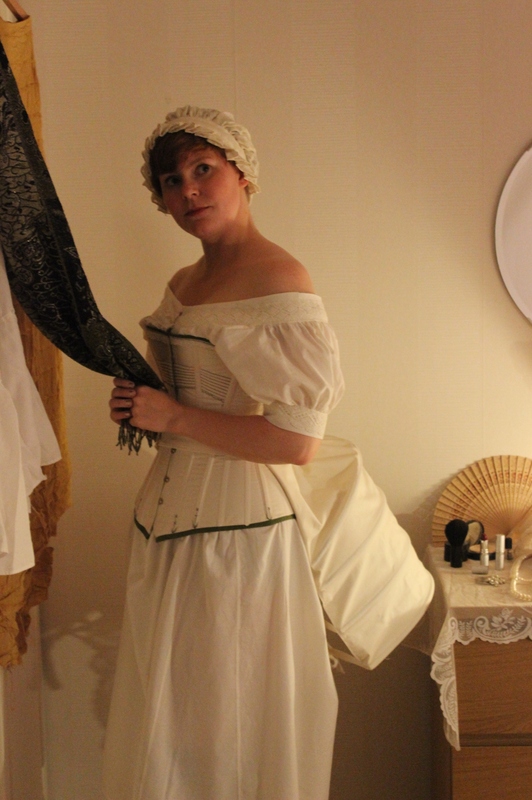 But for now, the late Regency (1820-1830) undergarments I do have works just fine. 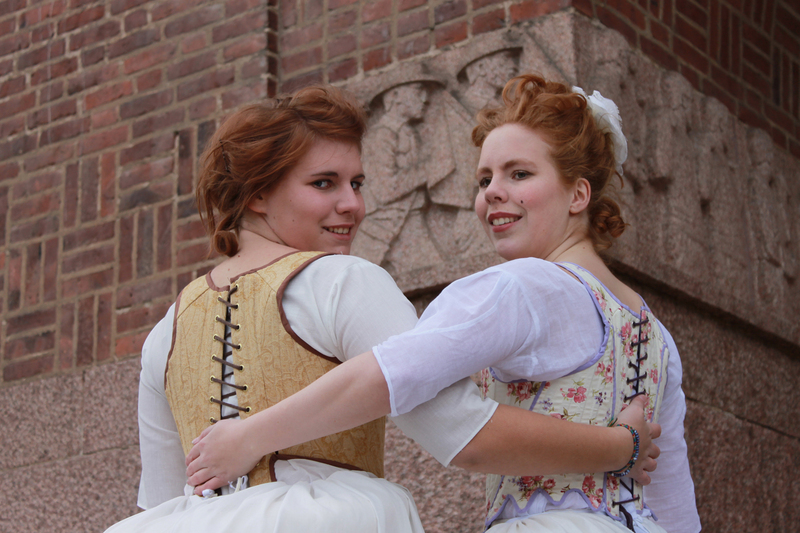 Here are some pictures which me and my sister took last spring. 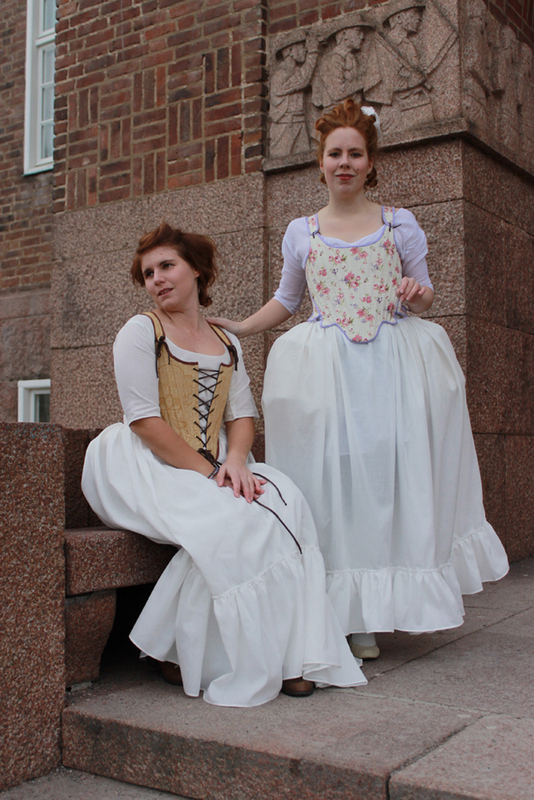 We dressed up in 18th century underwear (1750s, 1780s & 1790s) and posed in front of the beautiful building next to my home.